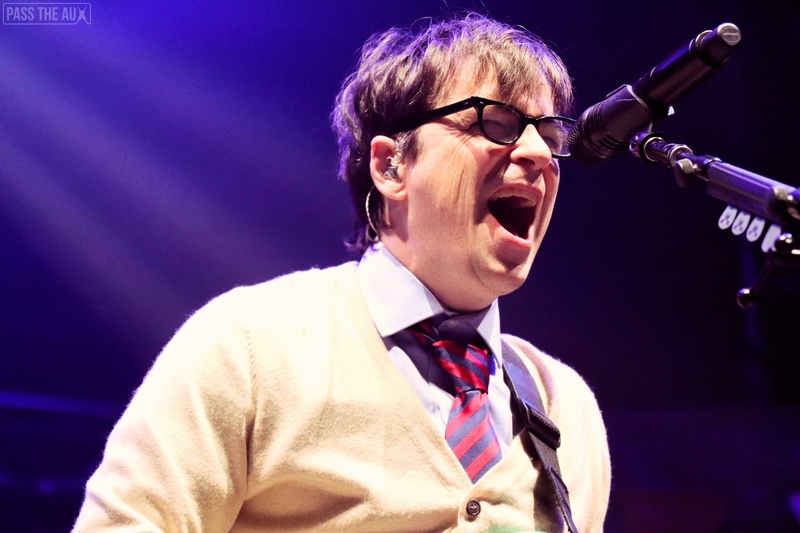 It’s rare to come across anyone who remembers the early 90’s well yet doesn’t have strong opinions about Weezer. 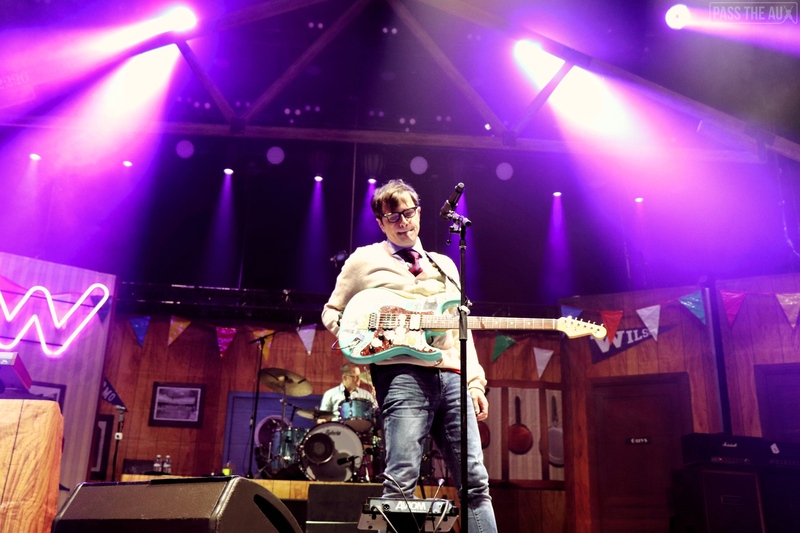 Sure, there have been several valid arguments over the years that Rivers Cuomo has lost the plot a bit, but not a single person at The Forum on Wednesday gave a hoot about that. 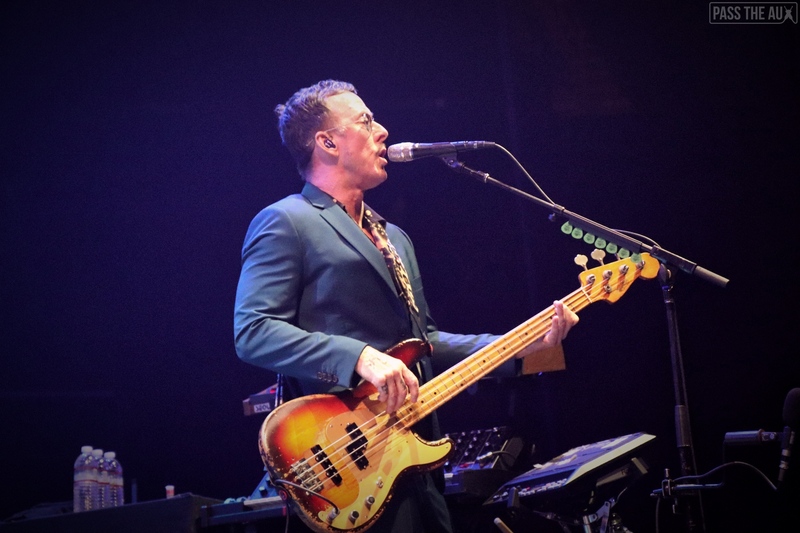 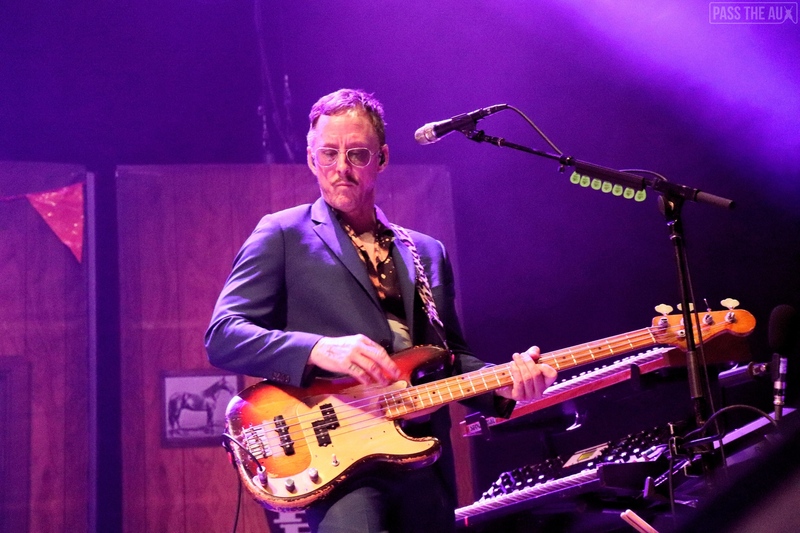 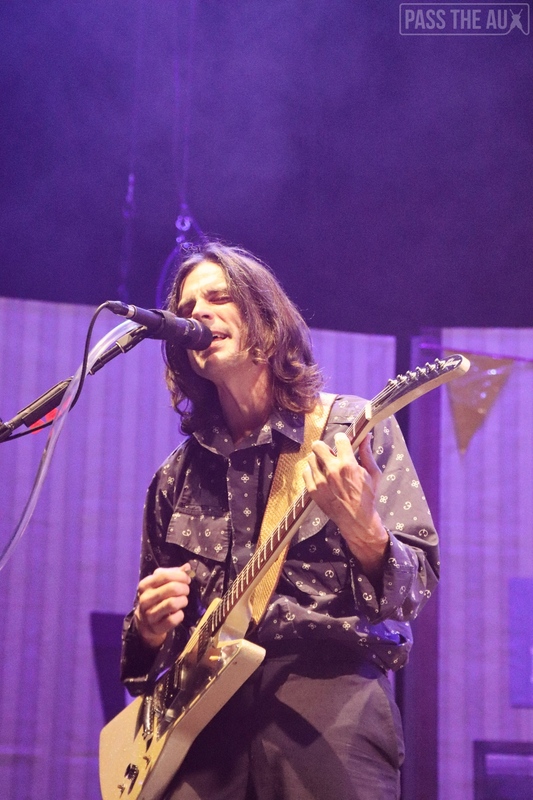 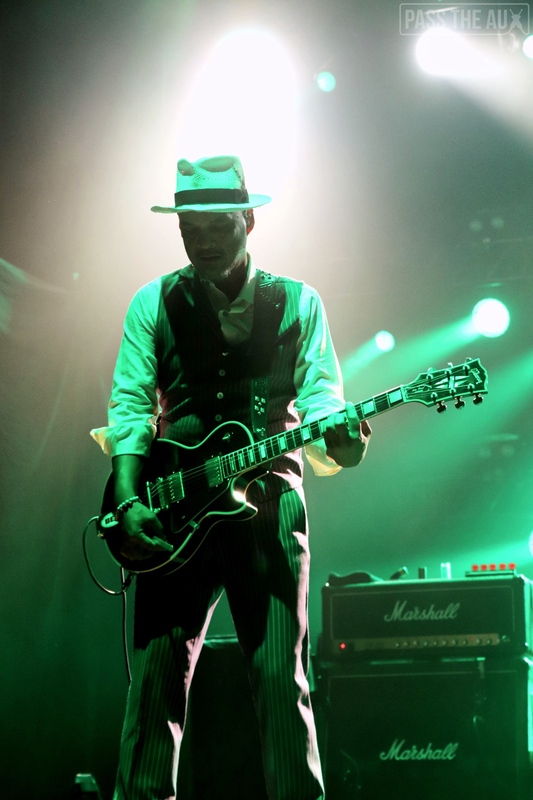 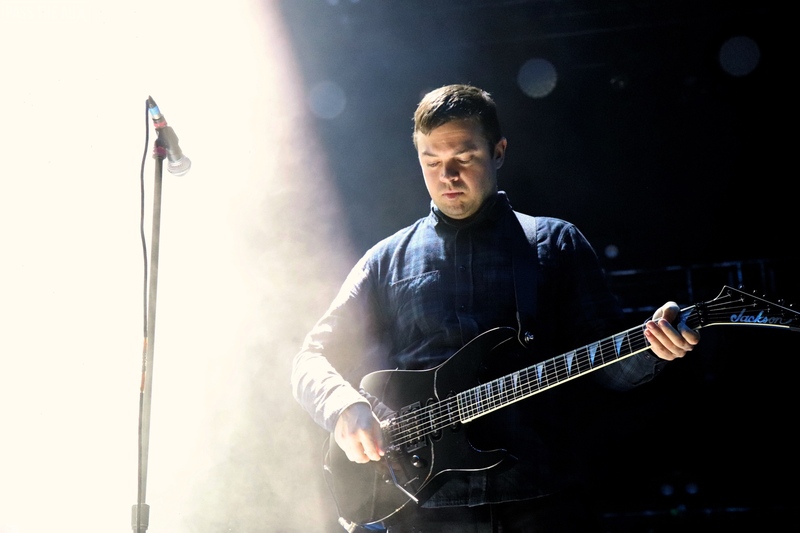 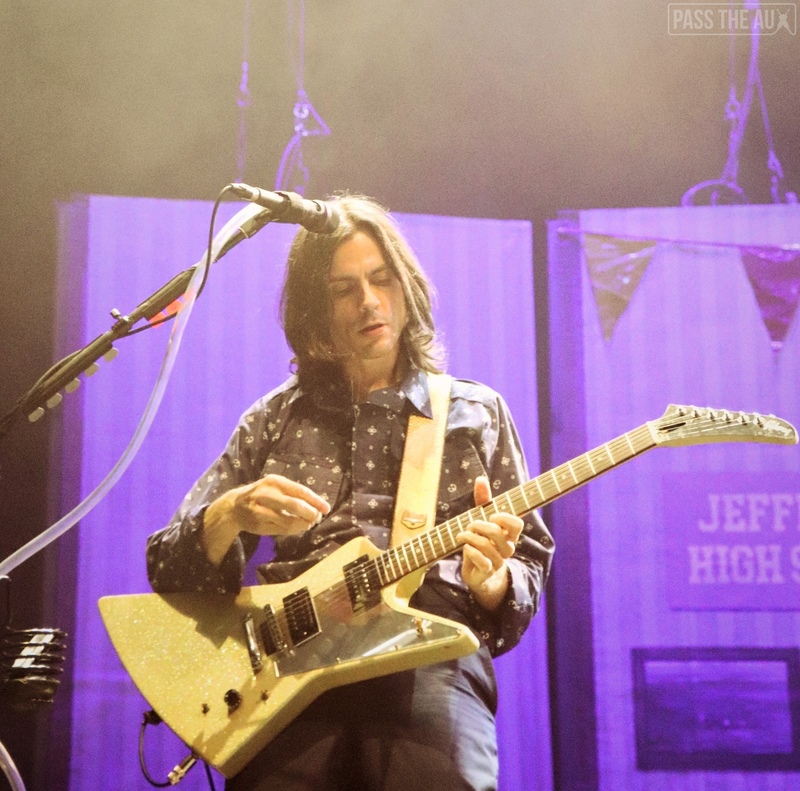 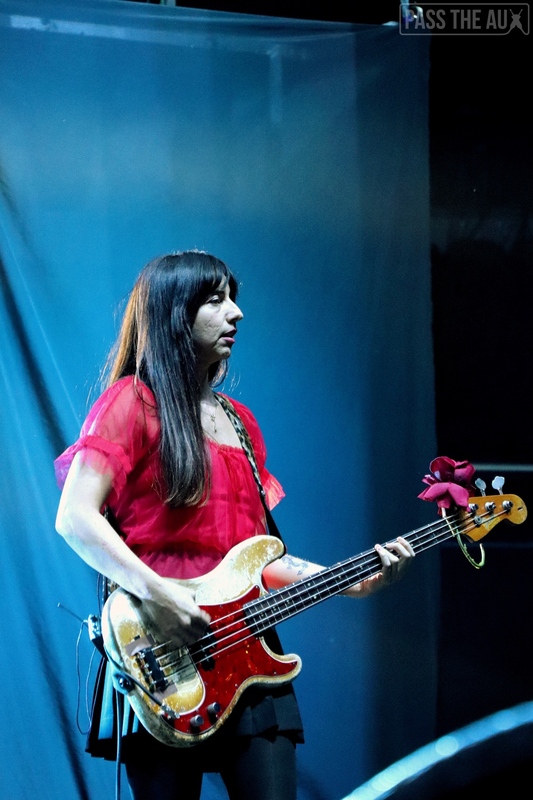 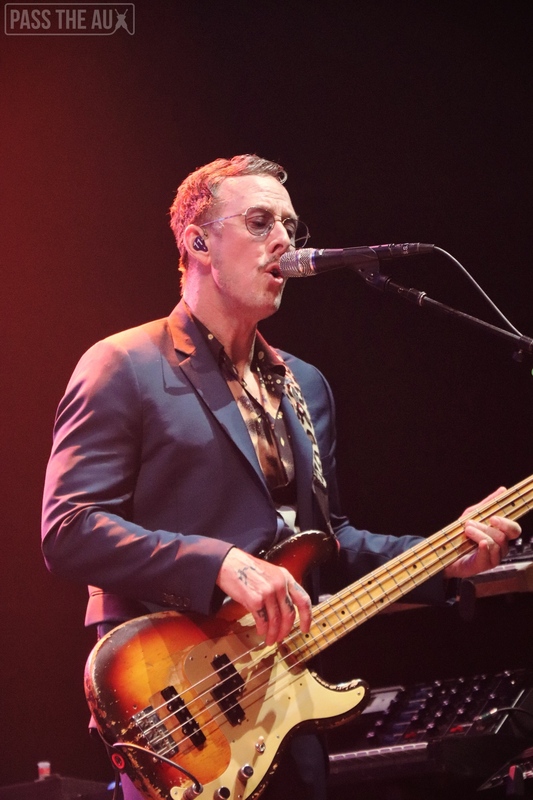 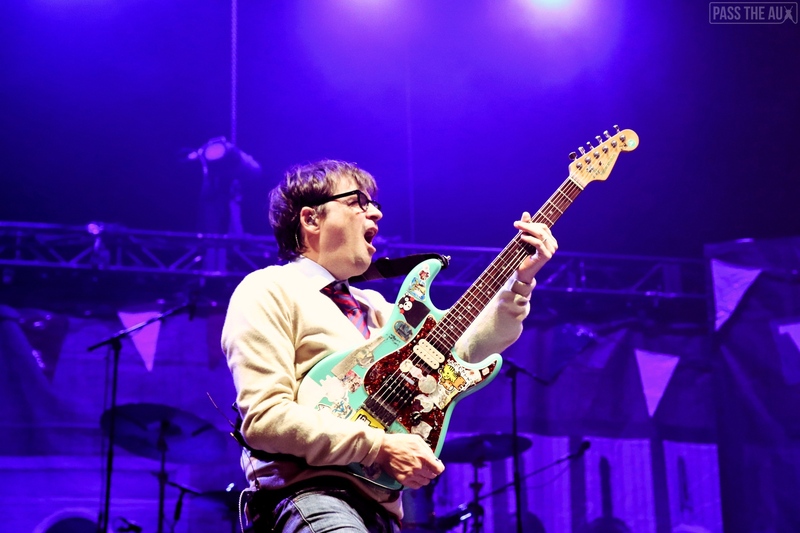 In a hometown show for the ages, Weezer headlined a night of eclectic yet high-class entertainment at The Forum, featuring distorted pop Brooklynites Sleigh Bells and alternative rock legends, the Pixies. 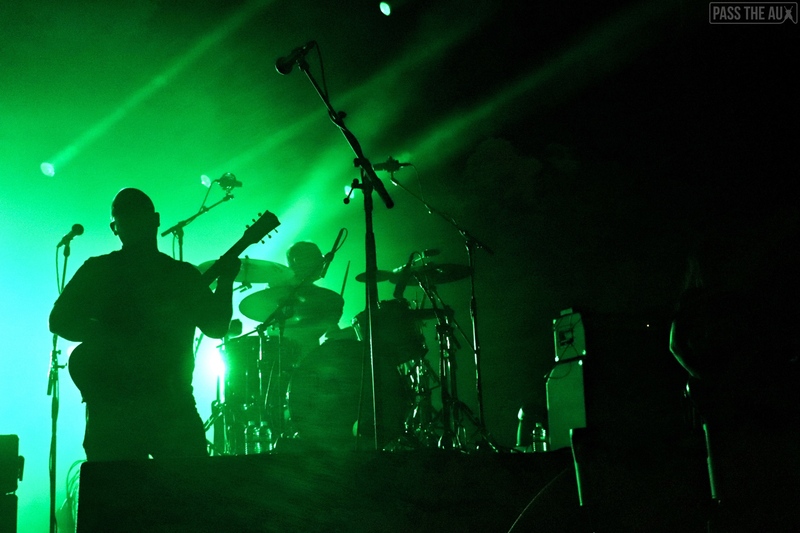 One might argue that such a sonically and generationally dissonant lineup might make for an odd night, but it didn’t. 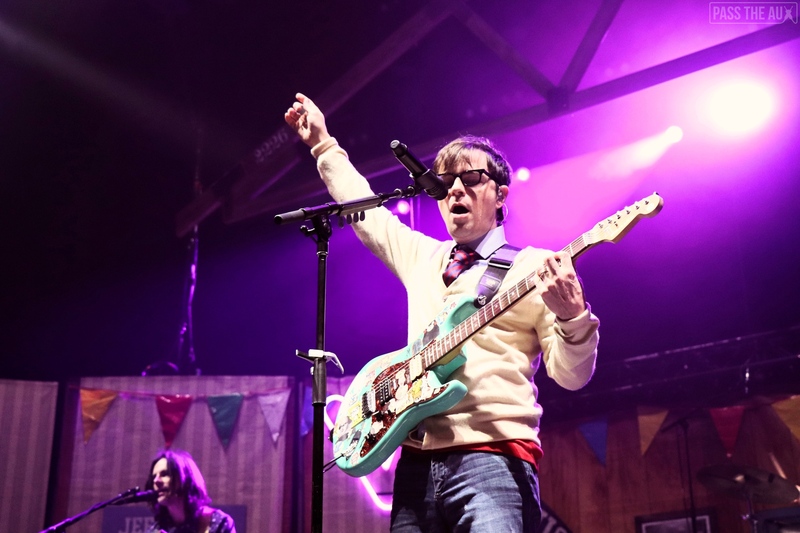 Somehow, as if the whole evening came from the head of Rivers Cuomo himself, it was weird but still worked. 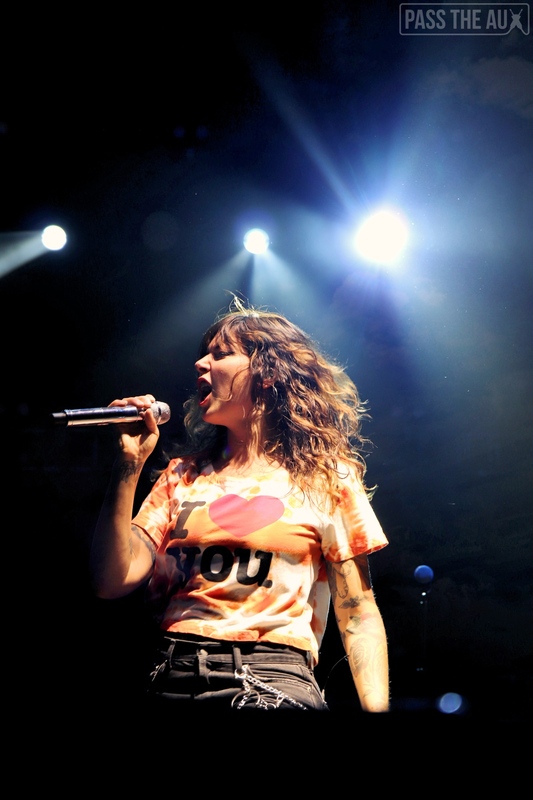 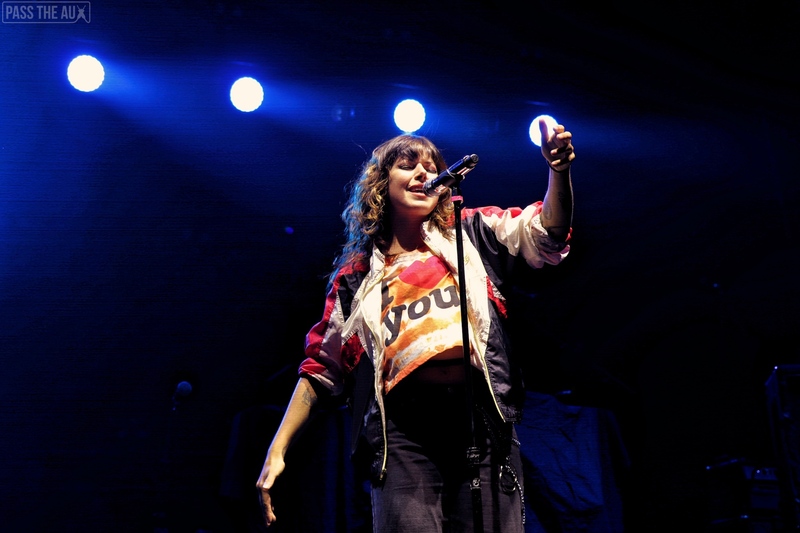 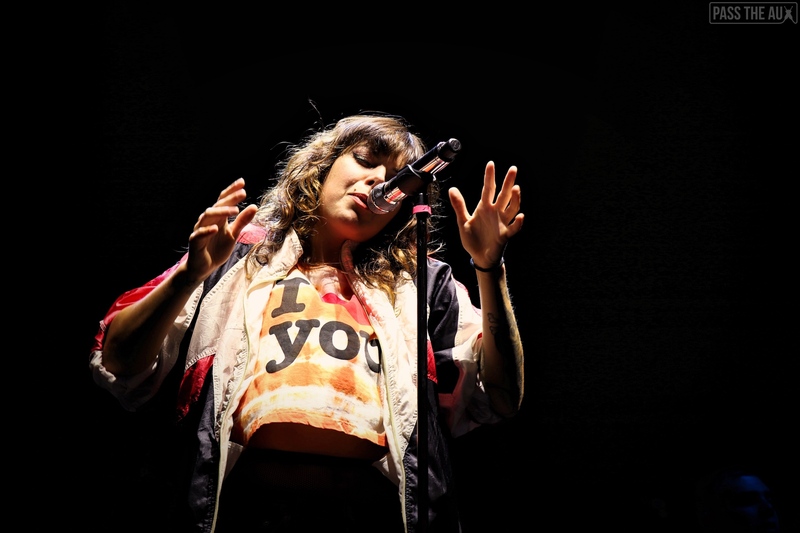 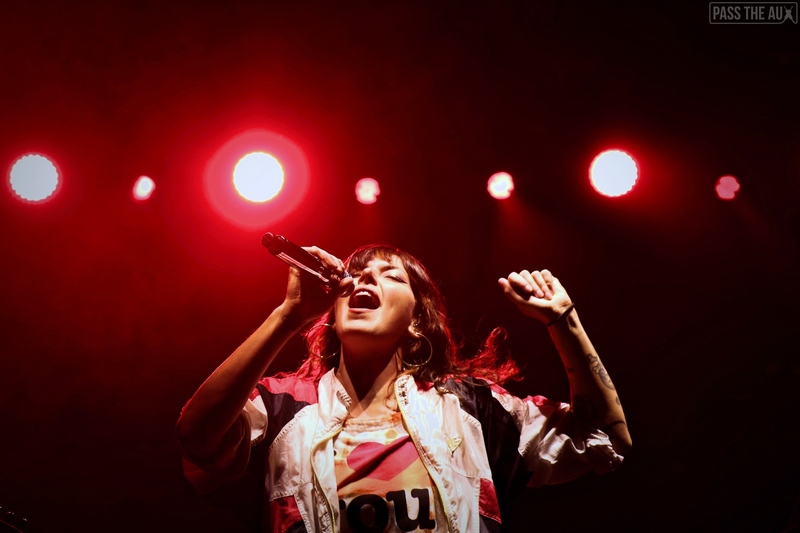 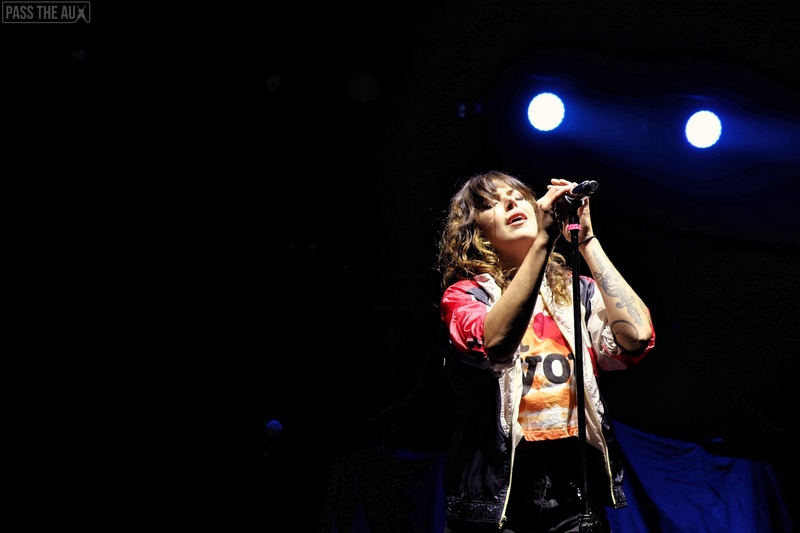 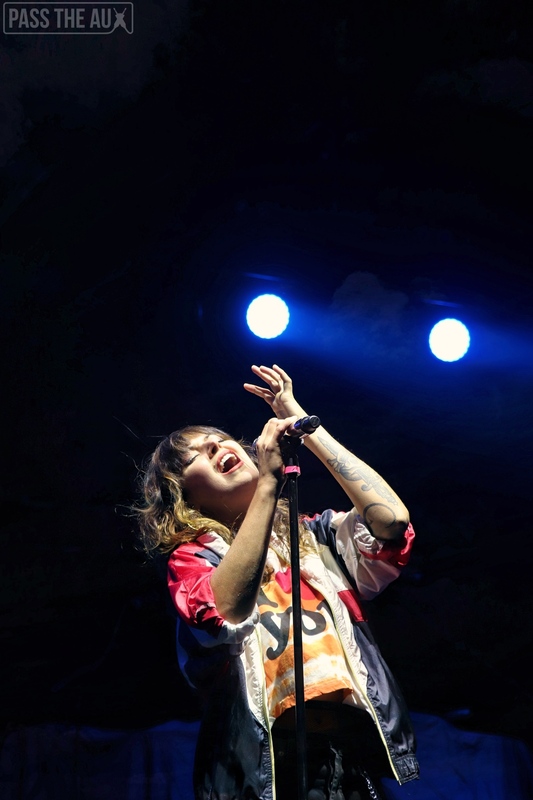 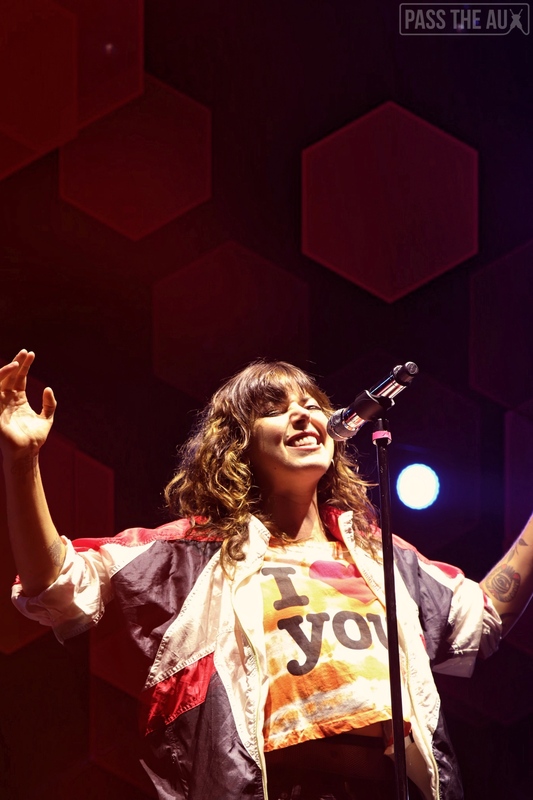 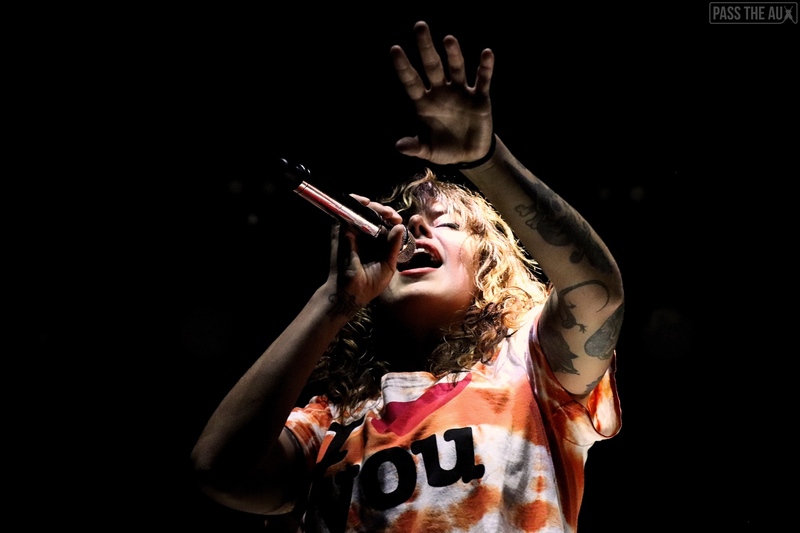 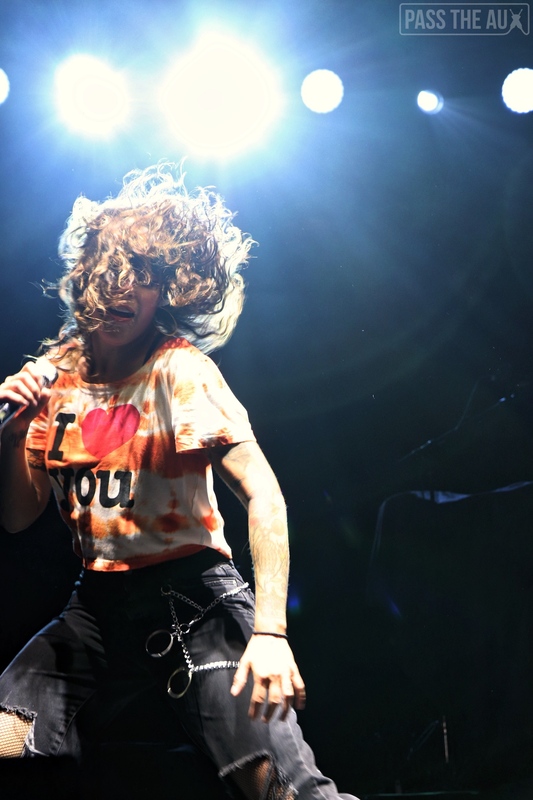 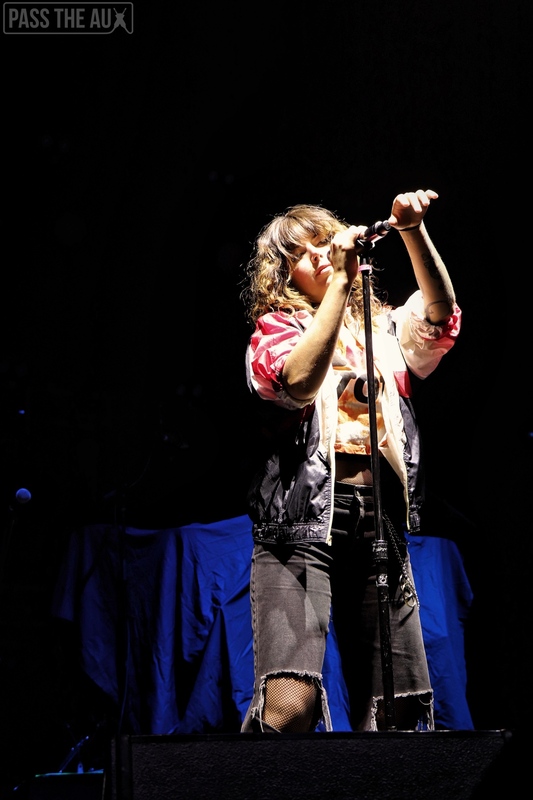 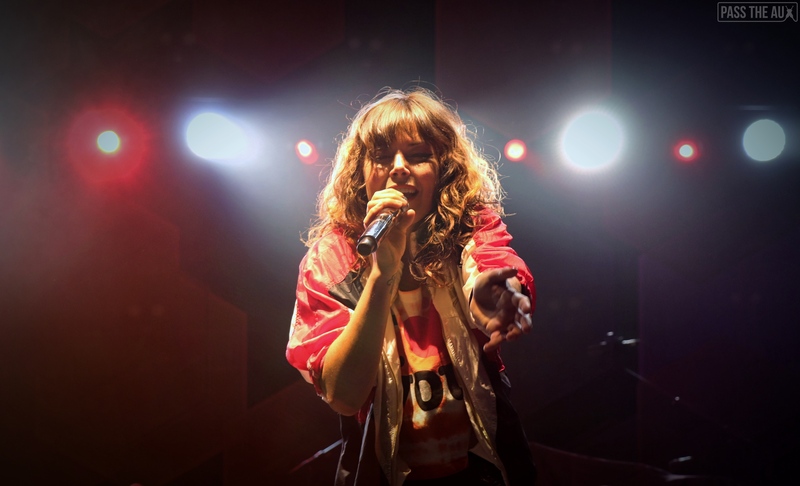 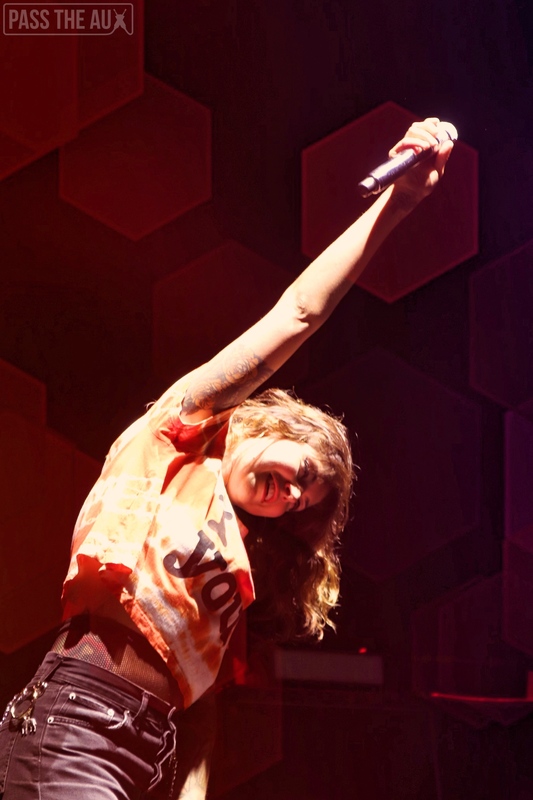 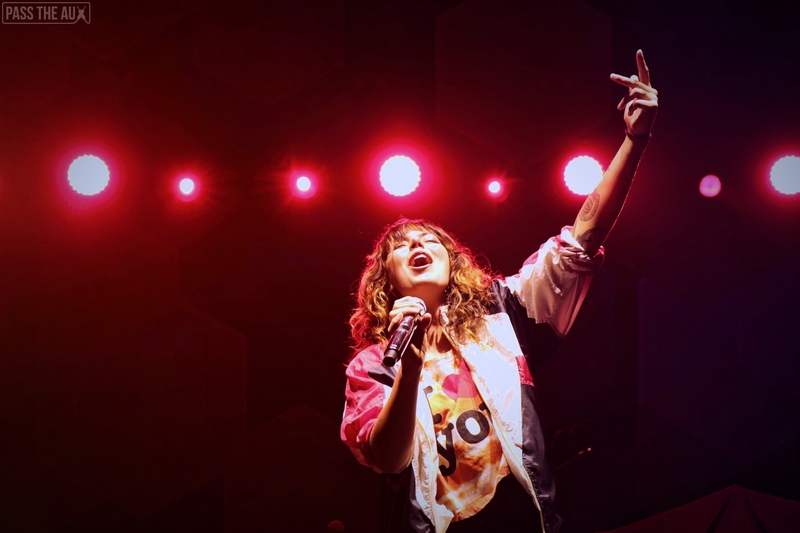 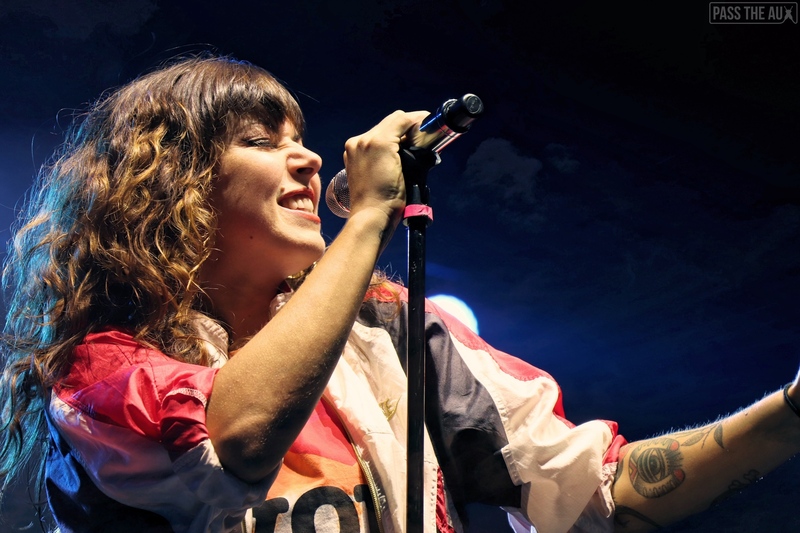 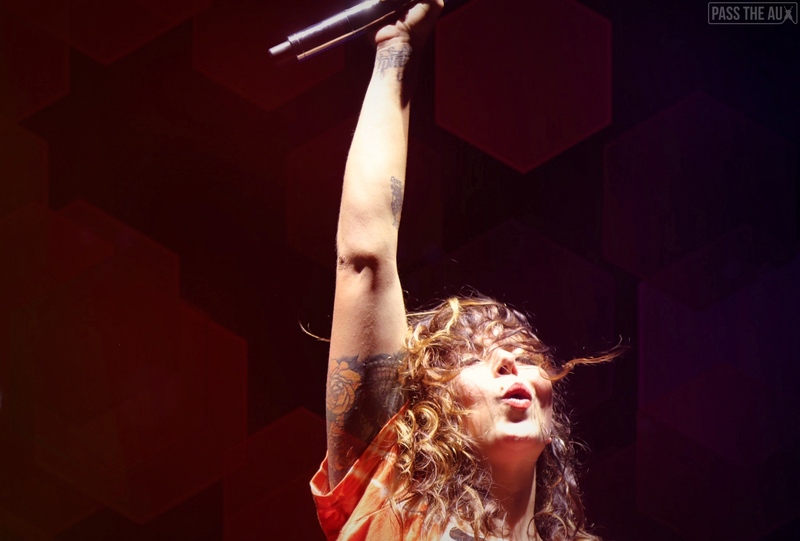 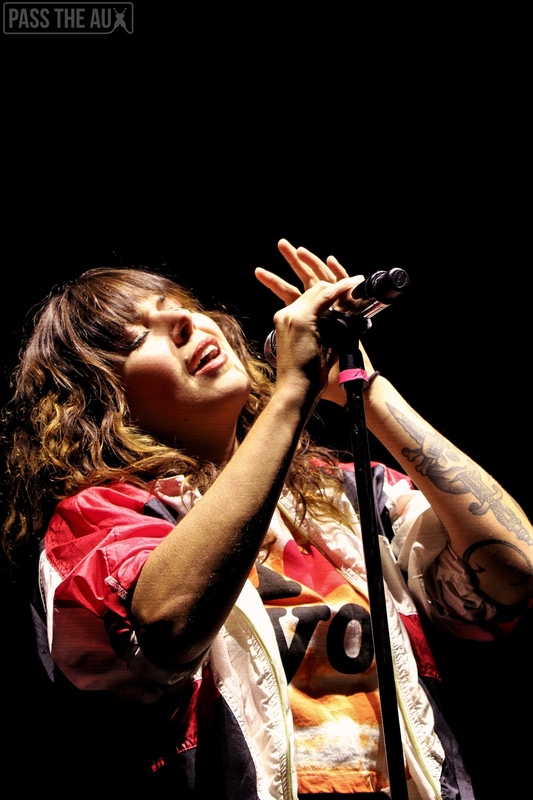 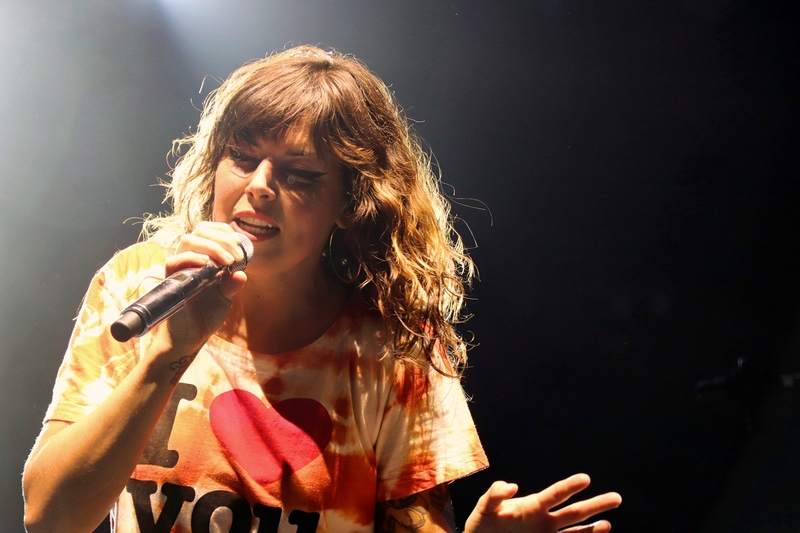 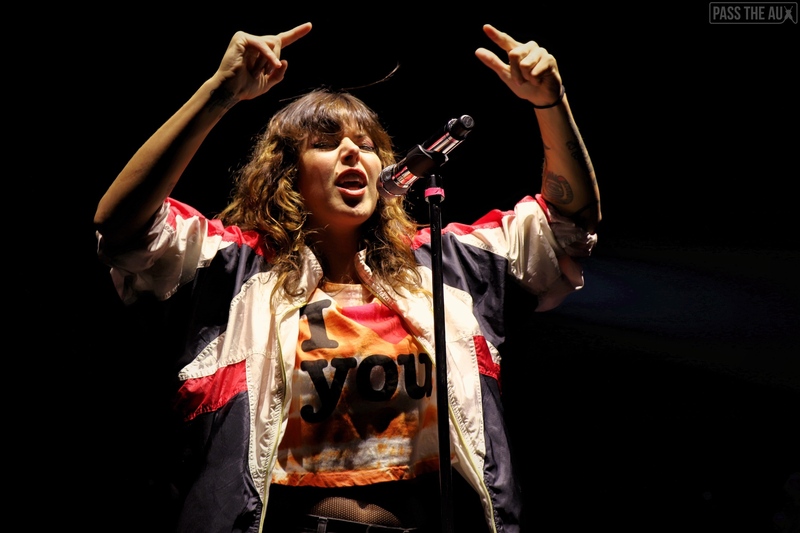 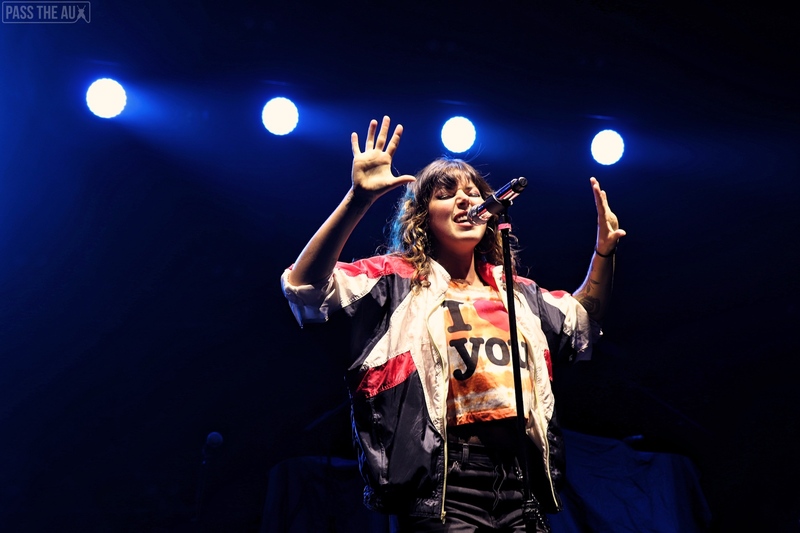 Starting the night off strong, Sleigh Bells’ Alexis Krauss led the duo-now-trio through an emotional set full of energy and palpable electricity. 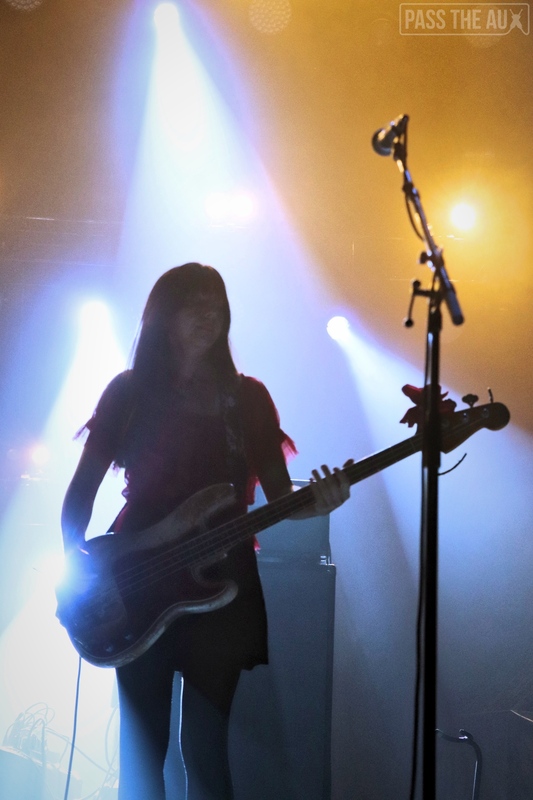 She flung her hair around with purpose as distorted guitars buzzed over her dreamy vocals on “Blue Trash Mattress Fire” and beats dropped on “Comeback Kid.” It’s been five years since their monster hit “Crown on the Ground” exploded thanks to Sofia Coppola’s The Bling Ring, and it still totally kills live. 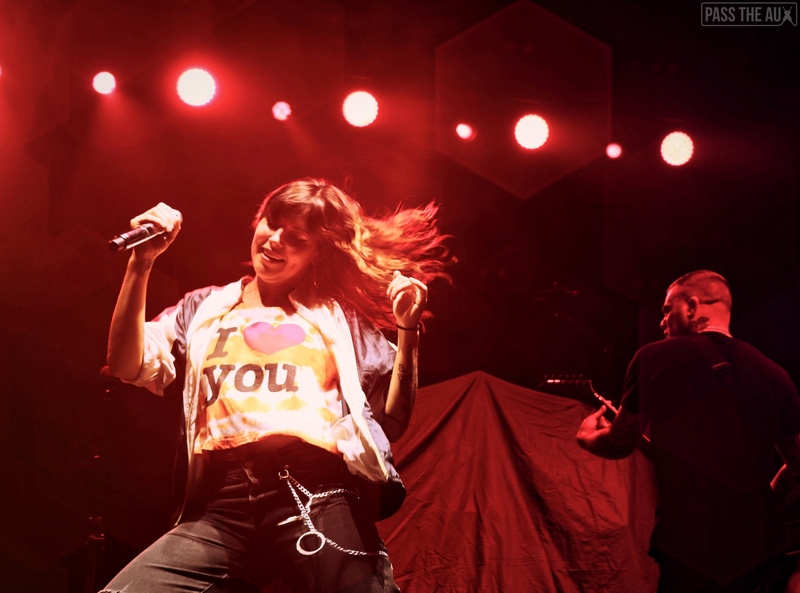 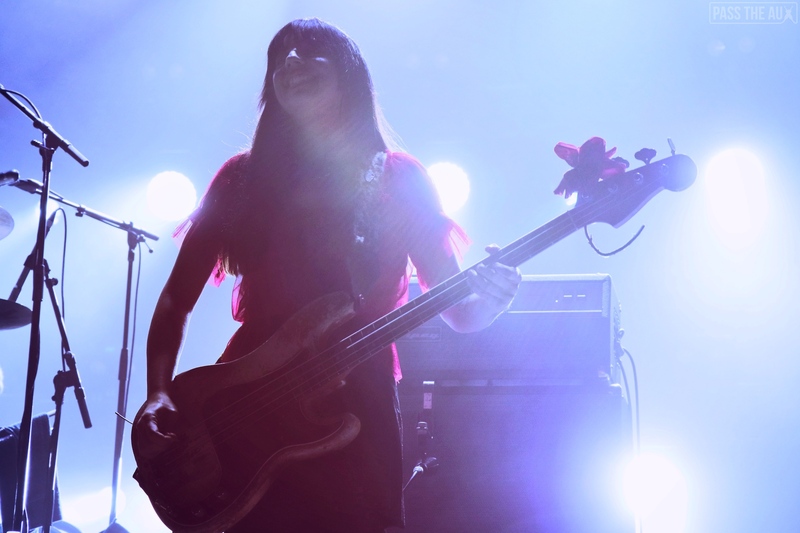 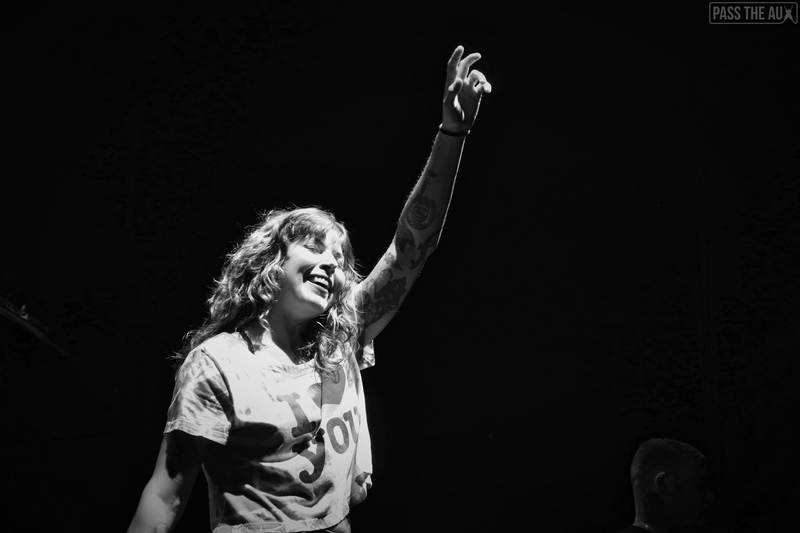 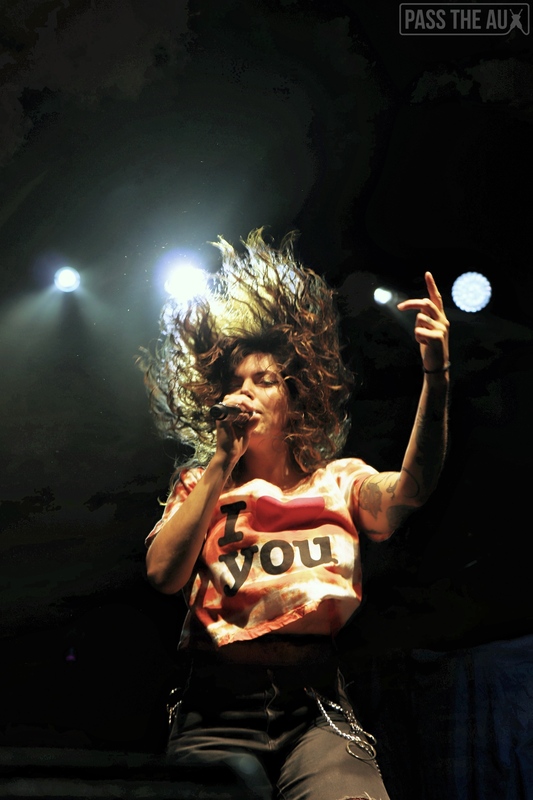 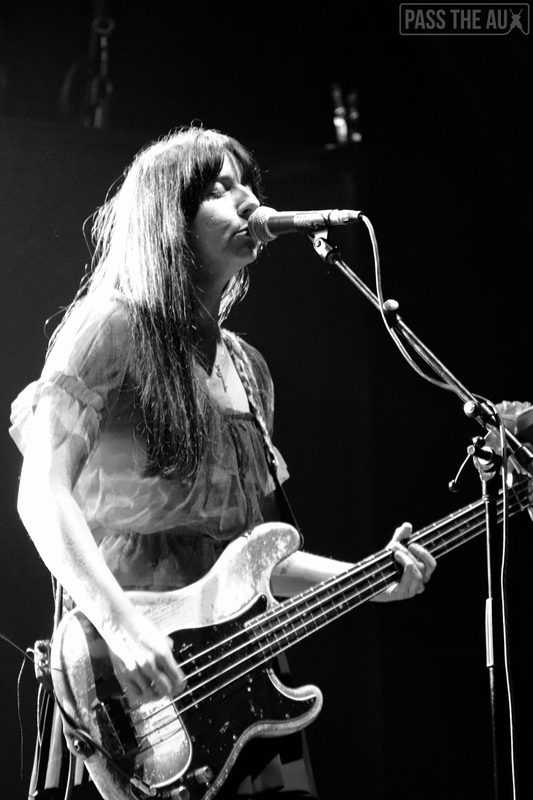 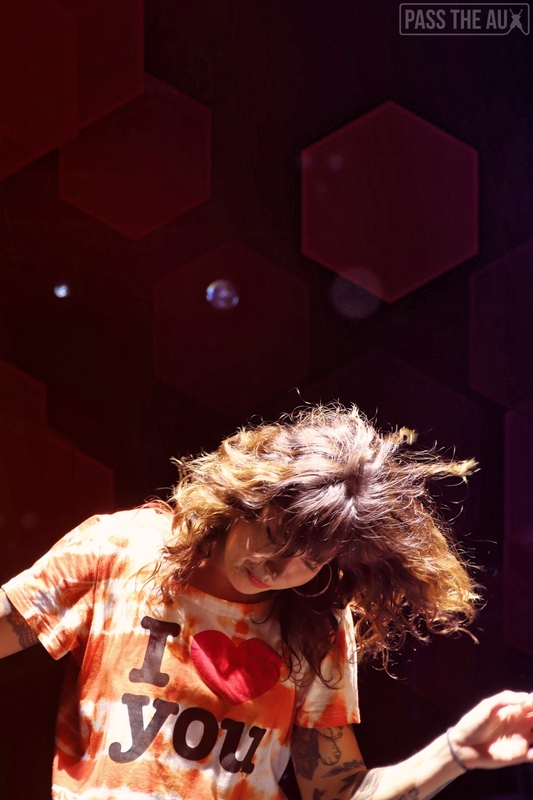 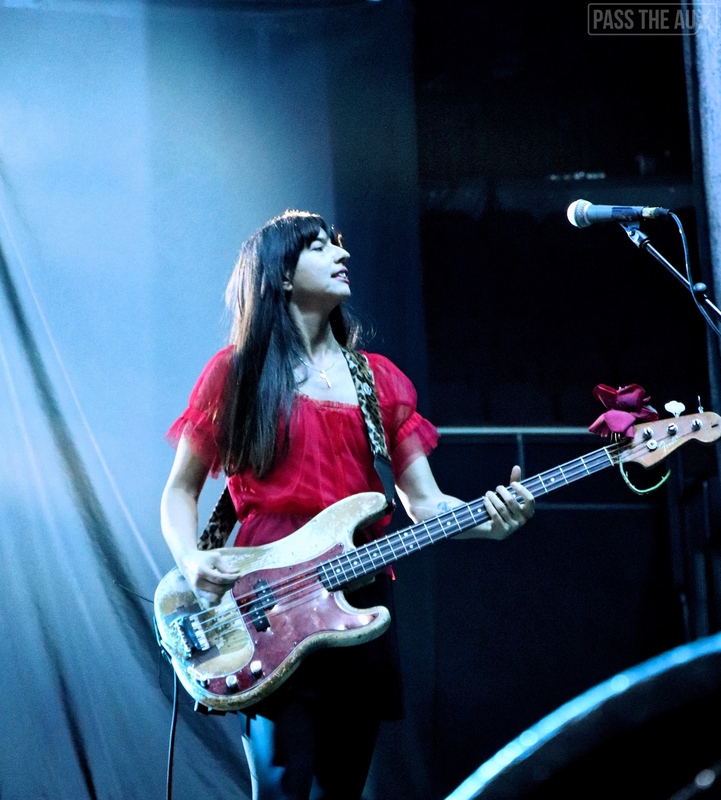 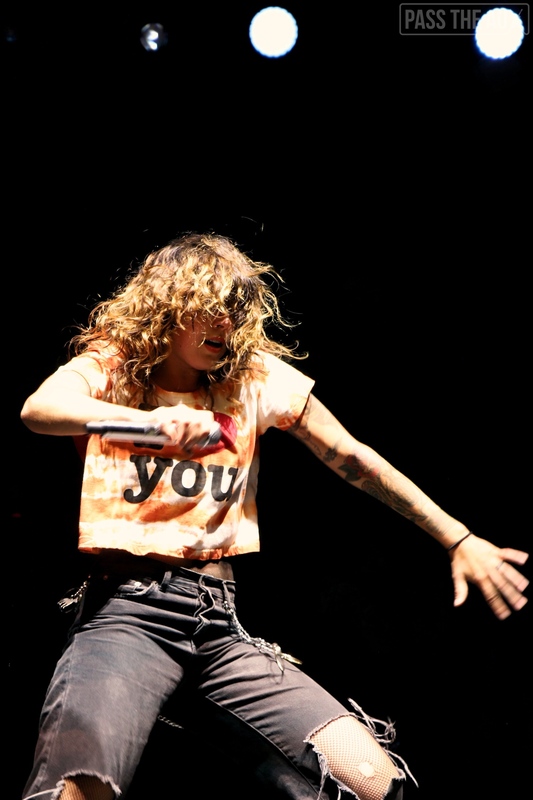 You can’t not dance when Sleigh Bells are on, and their live performance matches that energy perfectly. 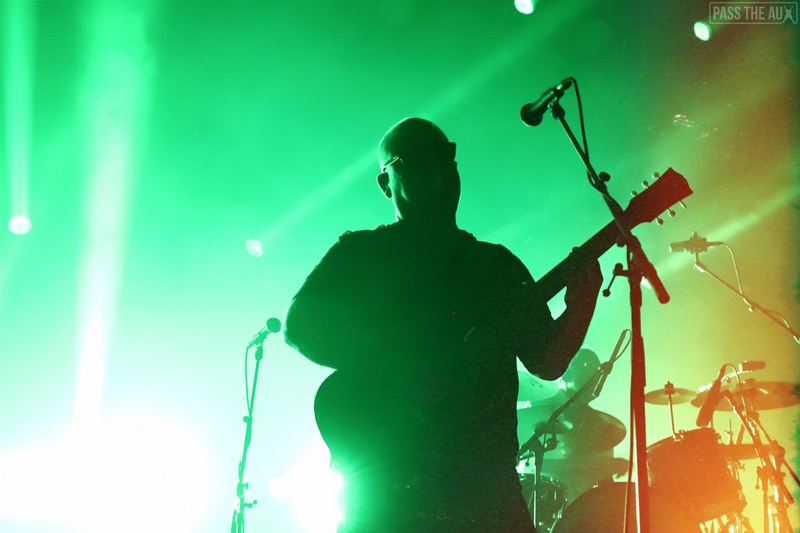 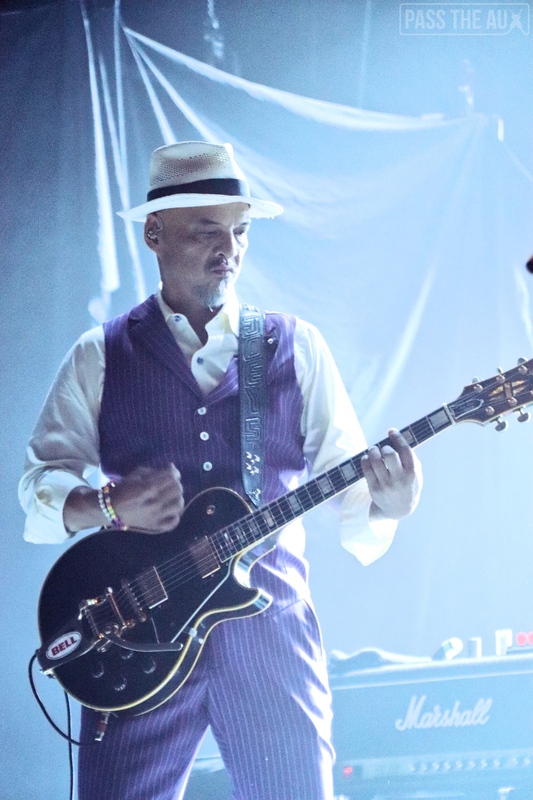 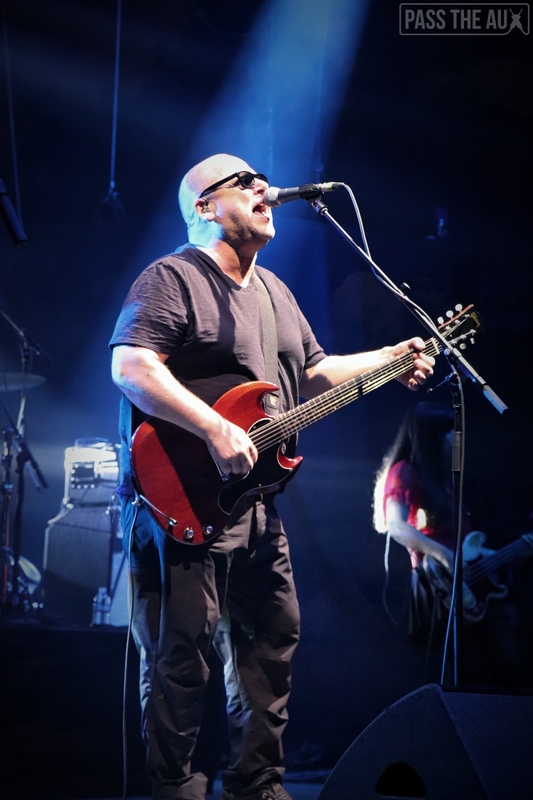 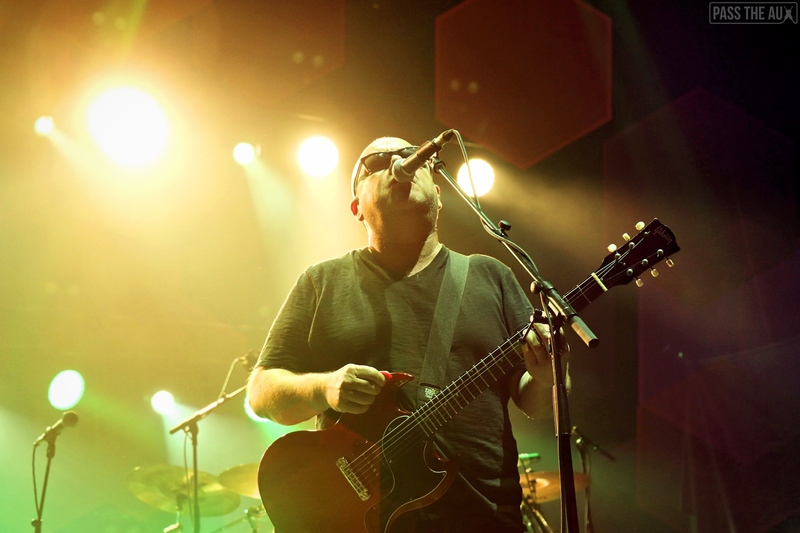 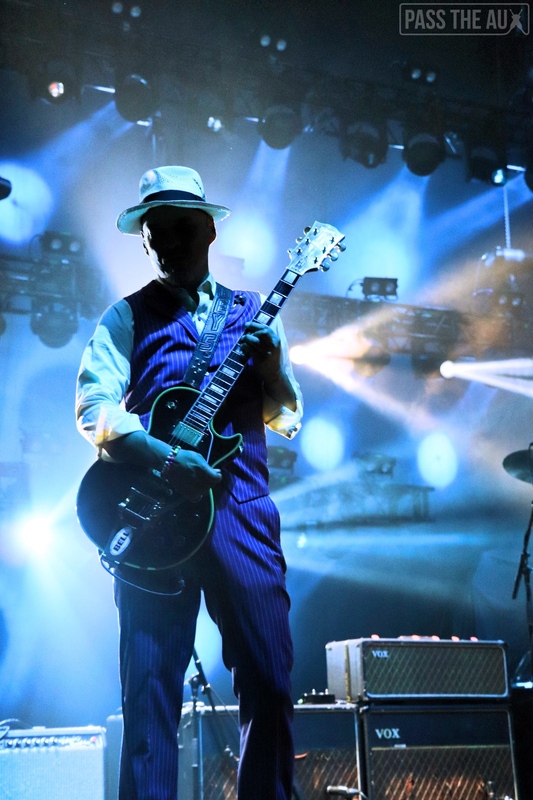 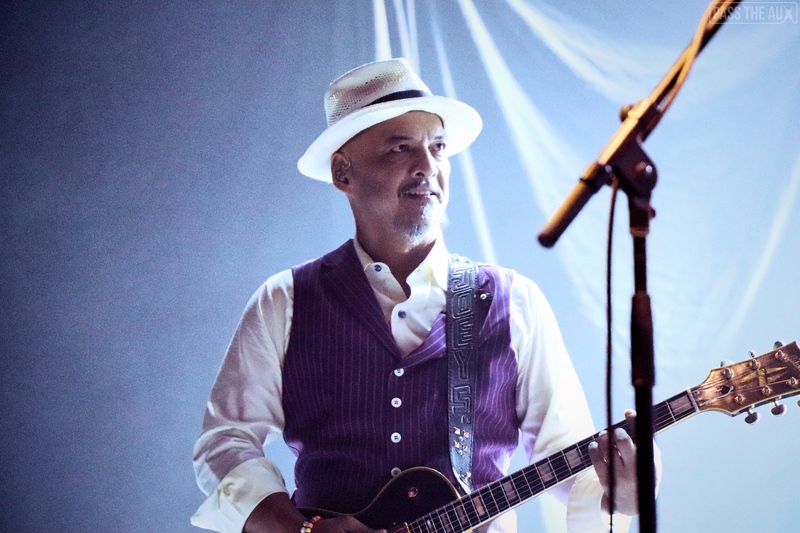 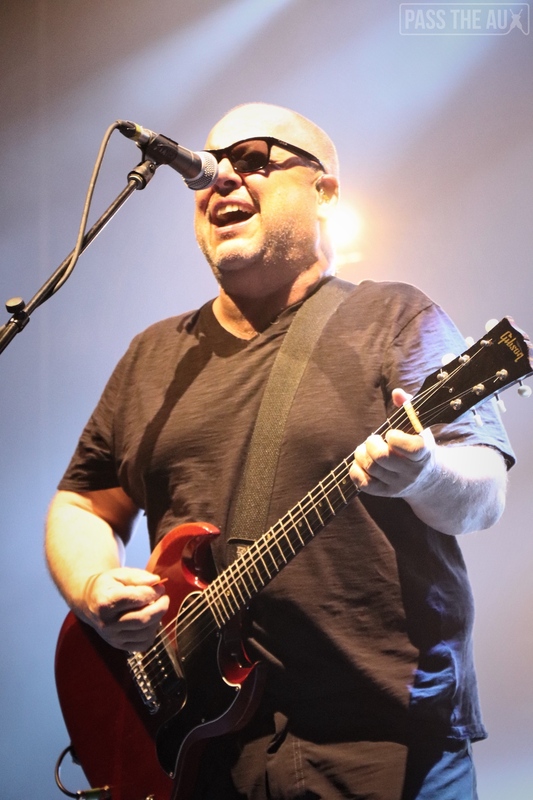 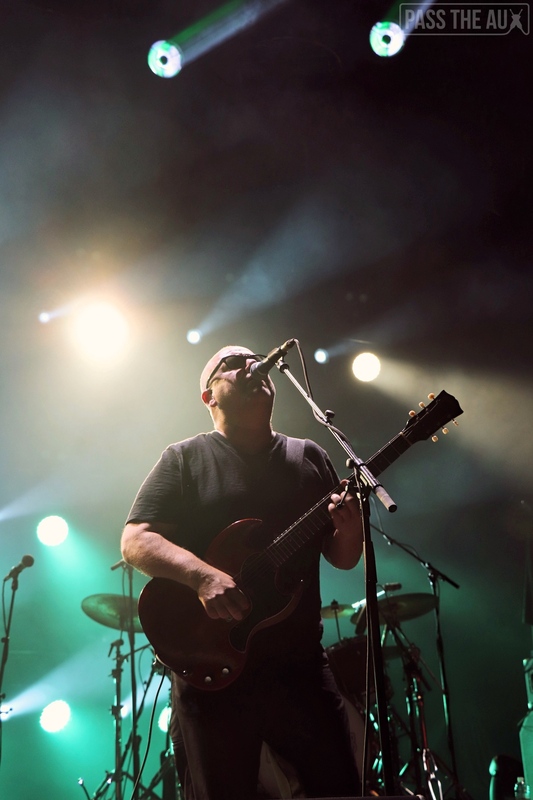 Without experiencing too much whiplash, the crowd welcomed the Pixies with open arms as the Bostonians played through eerie fog and near-darkness for two songs. 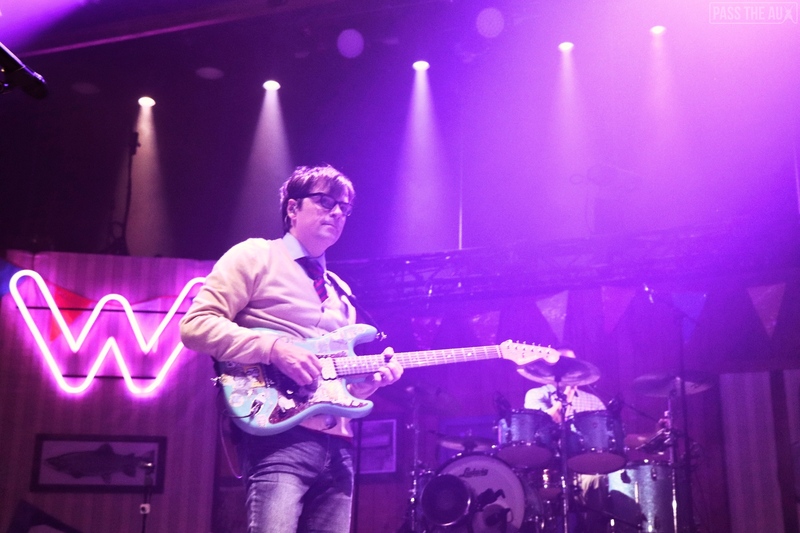 The 32-year-old band stood onstage like they owned it and you couldn’t help but feel like you were in the presence of true rock stars. 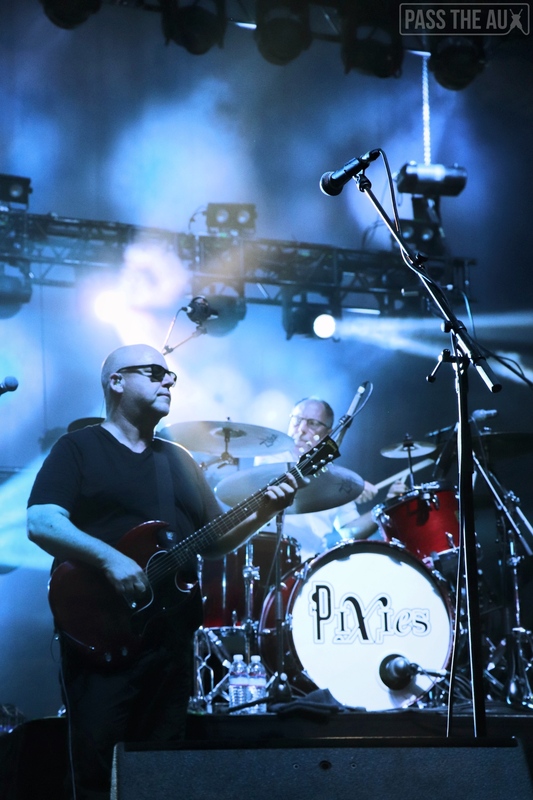 The crowd swelled at the opening notes of classic hits “Wave of Mutilation” and “Monkey Gone to Heaven” – and the band stood there like this was just any other Wednesday; because, to them, it was. 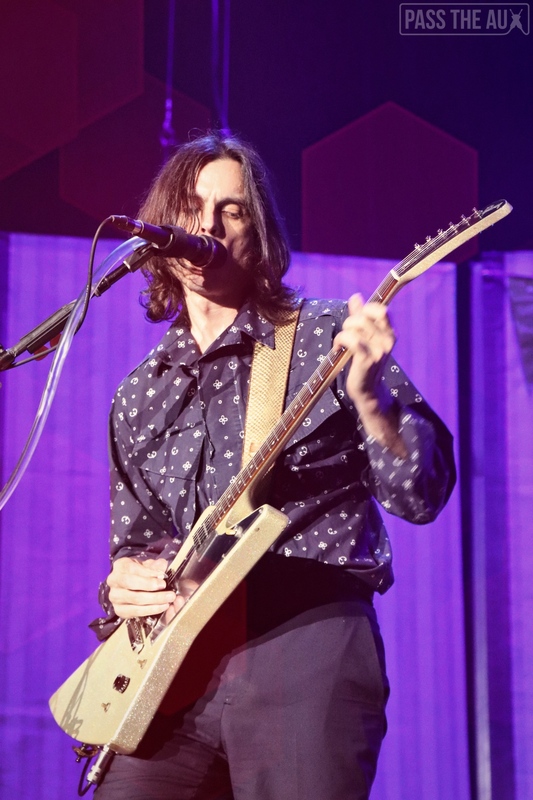 Forty-year-old dudes raised their phones in the crowd to capture bits of “Debaser” and everyone who’d ever seen Fight Club felt the emotional pang of the utterly brilliant “Where Is My Mind?” but no one would hear their indelible classic “Here Comes Your Man” because it didn’t make their 22-song set. 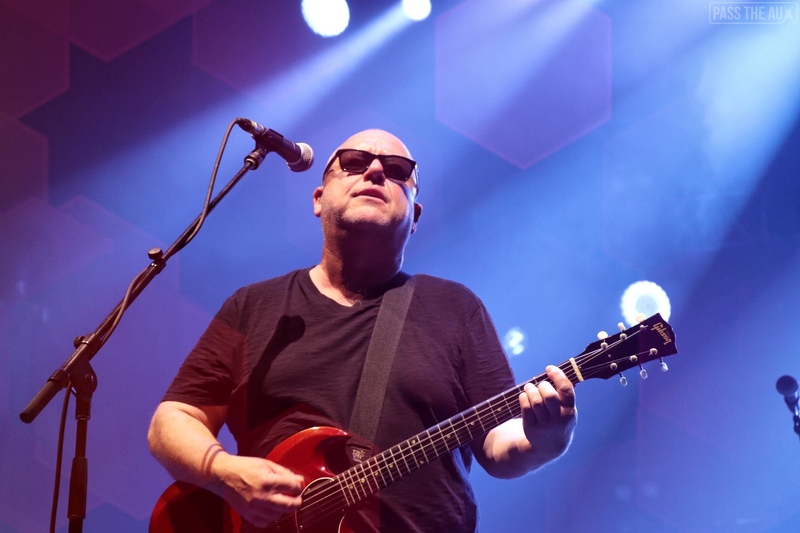 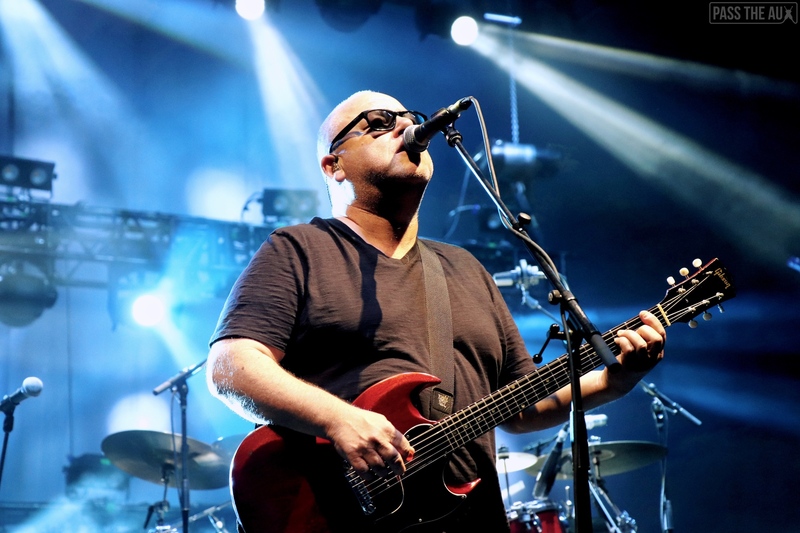 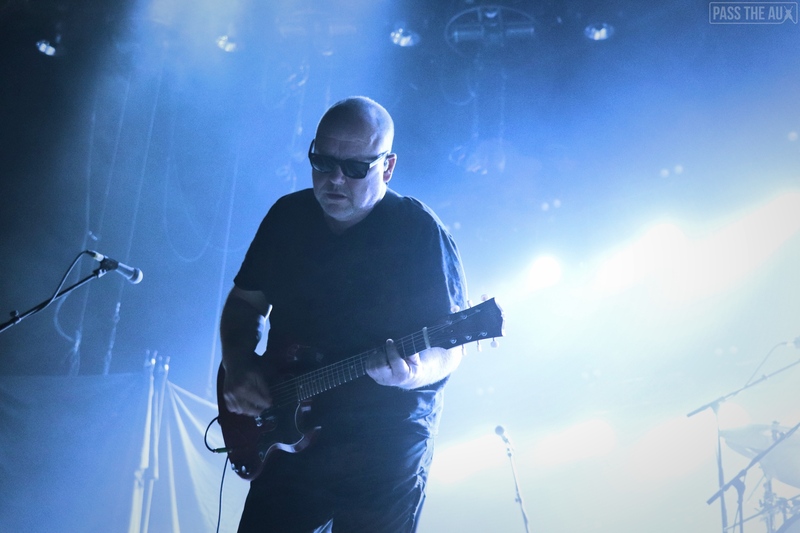 Black Francis and the Pixies are still cool, but perhaps a little too cool to play every hit. 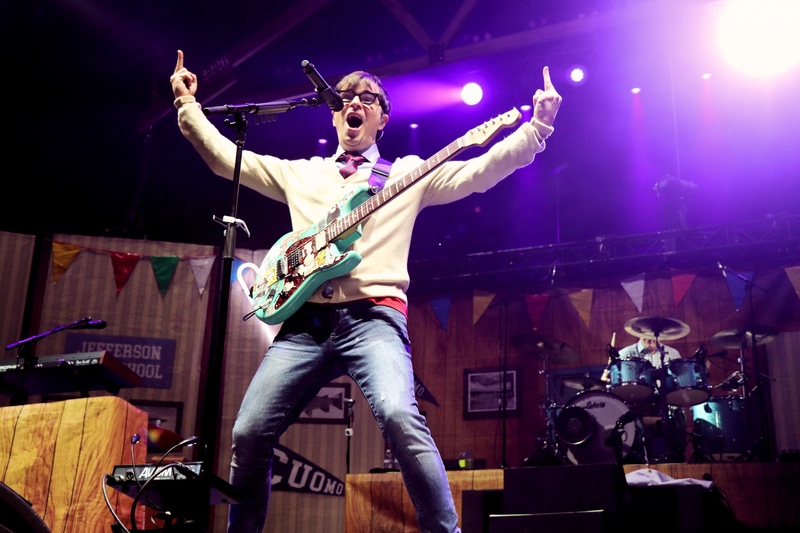 Luckily, Weezer took the opposite approach in every way possible. 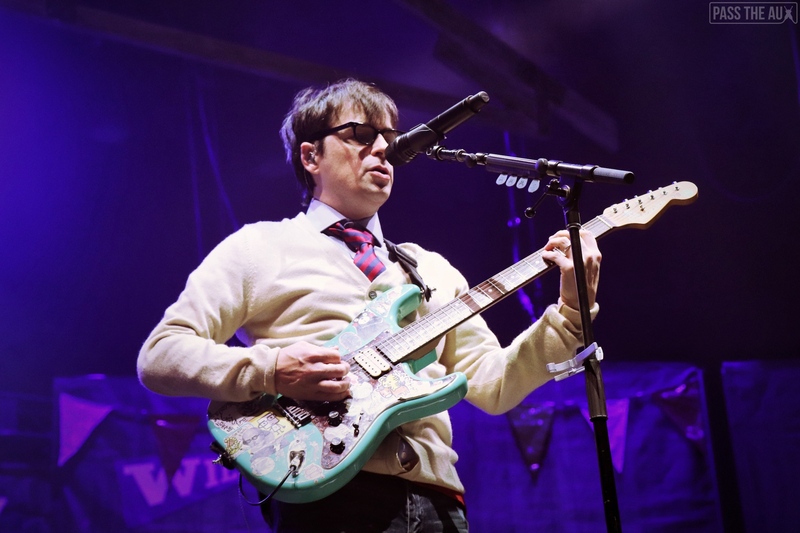 In an age wherein it’s so easy to be cynical towards the music industry and bitter about the supposed decaying of rock music in culture at large, Weezer simply does not care. 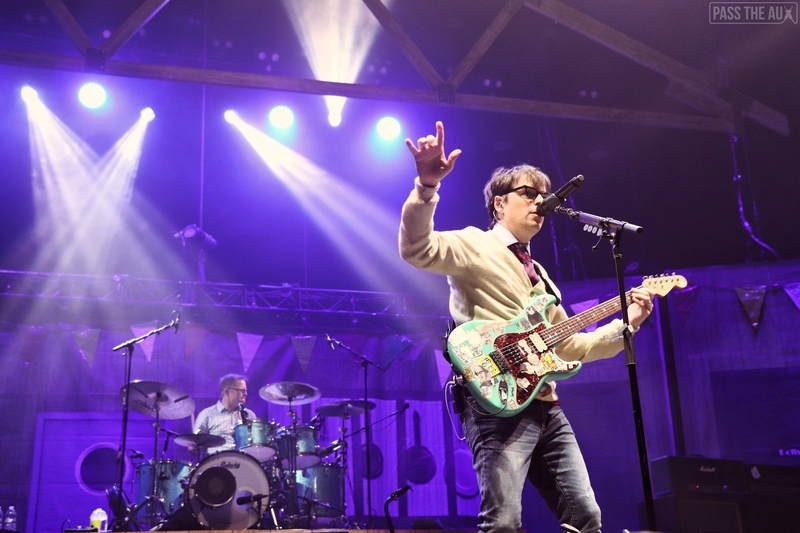 They could’ve done what many acts in their situation currently do: the night could’ve been leaning heavily on their less-than-stellar newest record Pacific Daydream with brief highlights of old hits included, and an overall understated performance that would’ve been enjoyable, sure – but not exactly what we wanted. 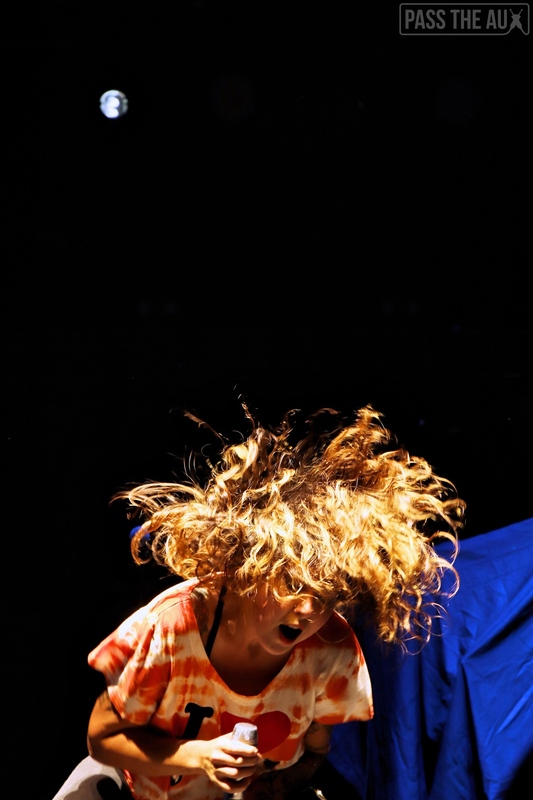 But they didn’t do that. 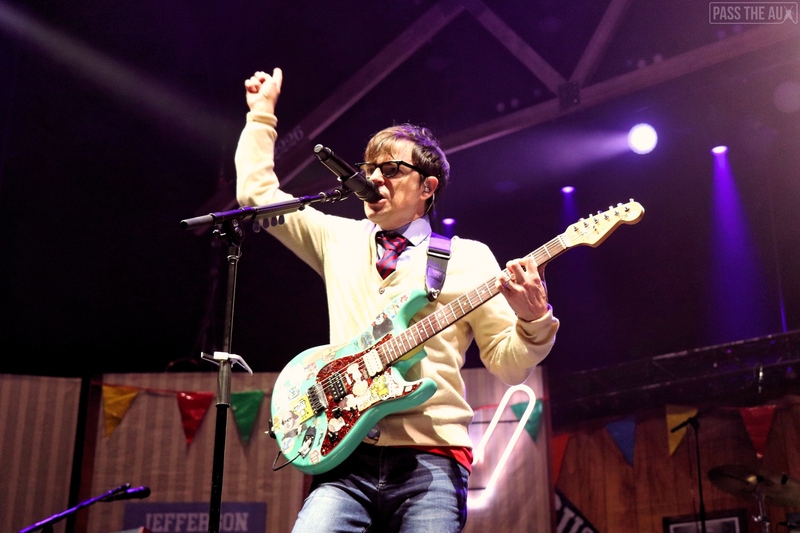 Rivers Cuomo is here to have fun and we’re just along for the ride. 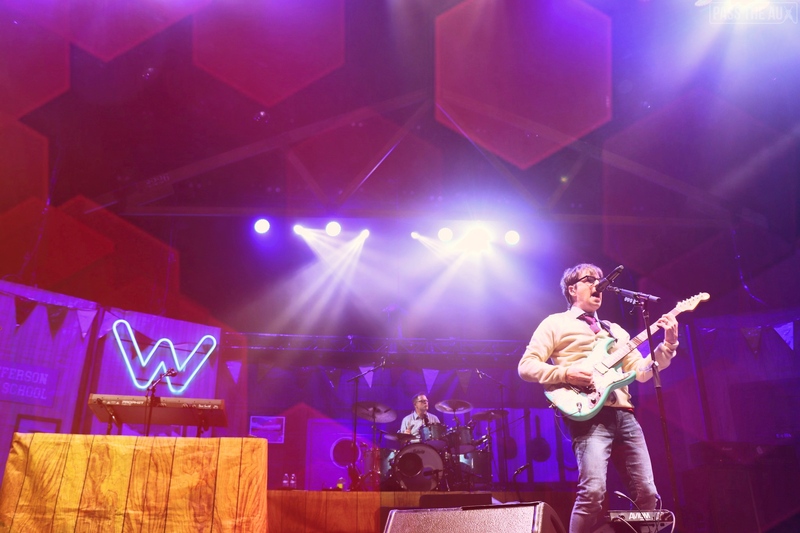 With a self-awareness level unironically shooting through the roof, Weezer opened their set appearing behind a large black curtain that revealed a stage dressed like Arnold’s diner from Happy Days. 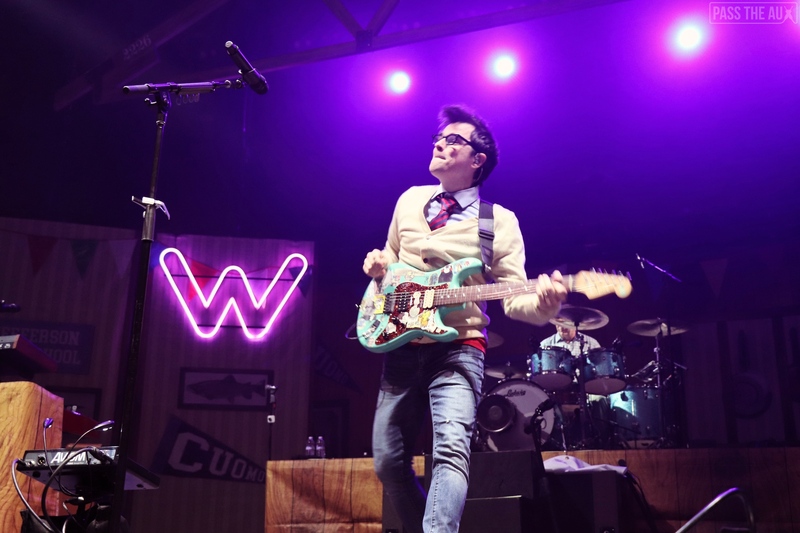 Referencing their own iconic music video, the band tore through “Buddy Holly” — dressed as they were in the video clip — with so much joy and excitement that it felt like 1994 again. 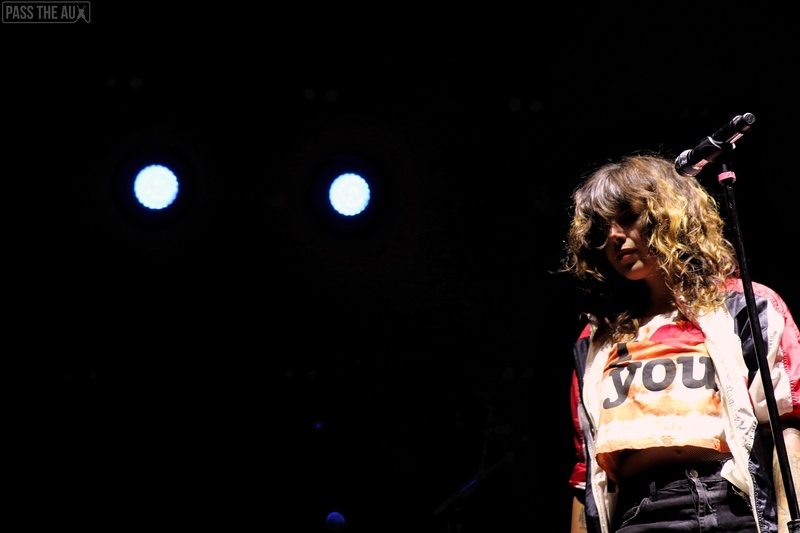 It wouldn’t take long to realize that that was their raison d’être entirely. 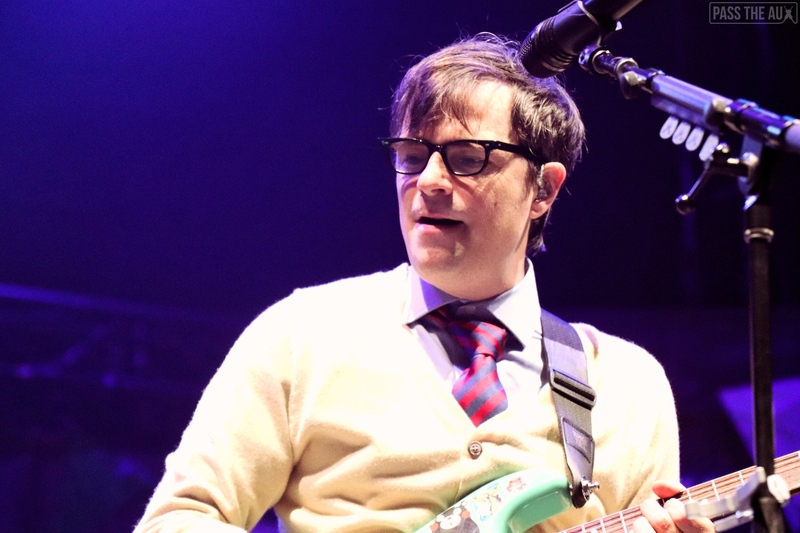 Jumping from album to album, Weezer knocked out Make Believe’s smash hit “Beverly Hills,” the Red Album’s lead single “Pork and Beans,” and the Blue Album’s “Undone (The Sweater Song)” in the first 10 minutes. 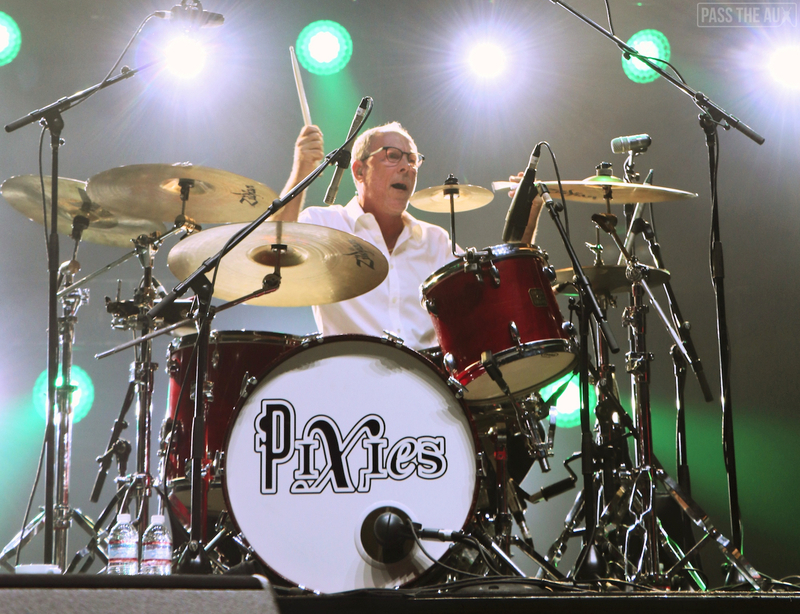 With any other group, you might ask yourself, Wow, why are they blaring through the hits so quickly? 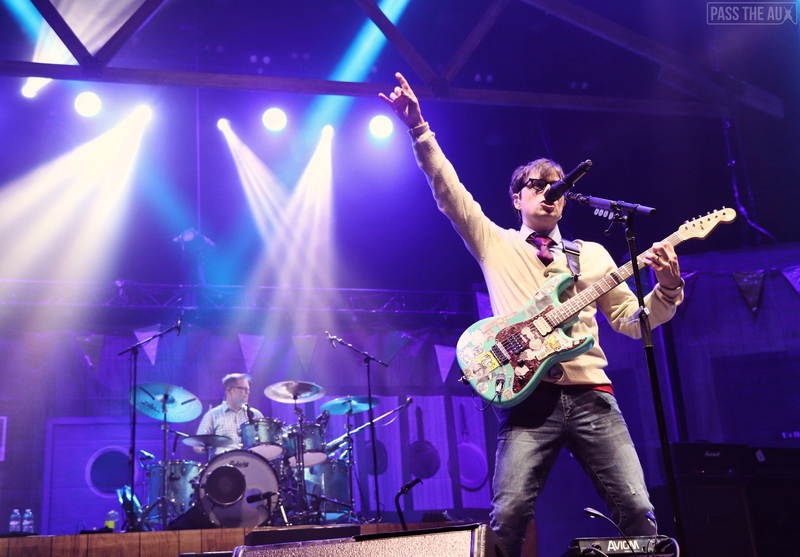 But with Weezer, the answer is obvious: because they have so many. 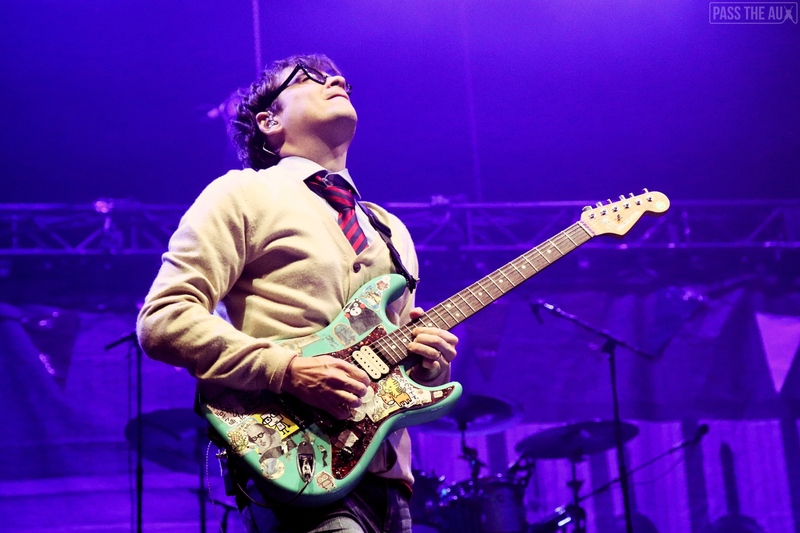 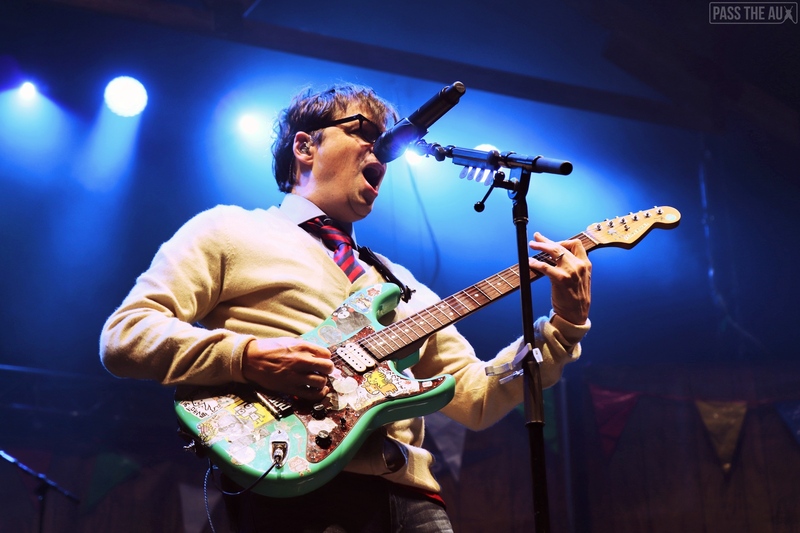 At 48 years old, Rivers Cuomo still has the energy of someone half his age. 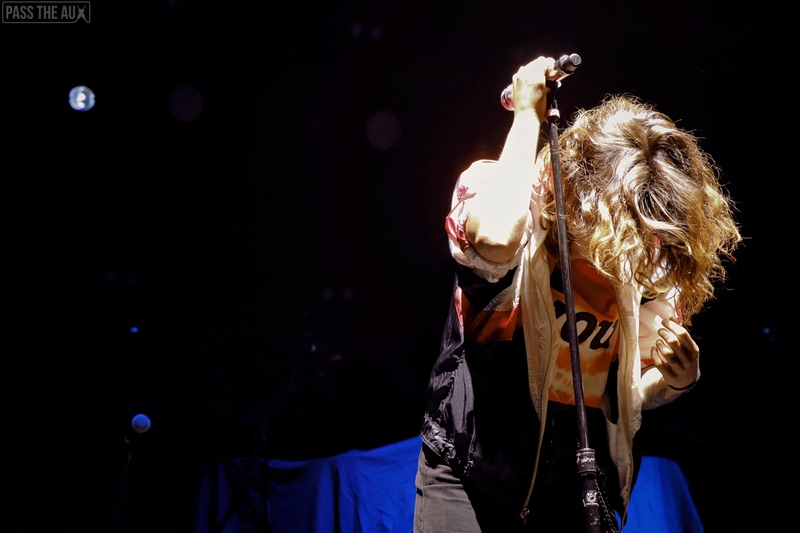 I counted no less than four costume changes that were all equal parts silly but worn with so little irony that you couldn’t help but smile. 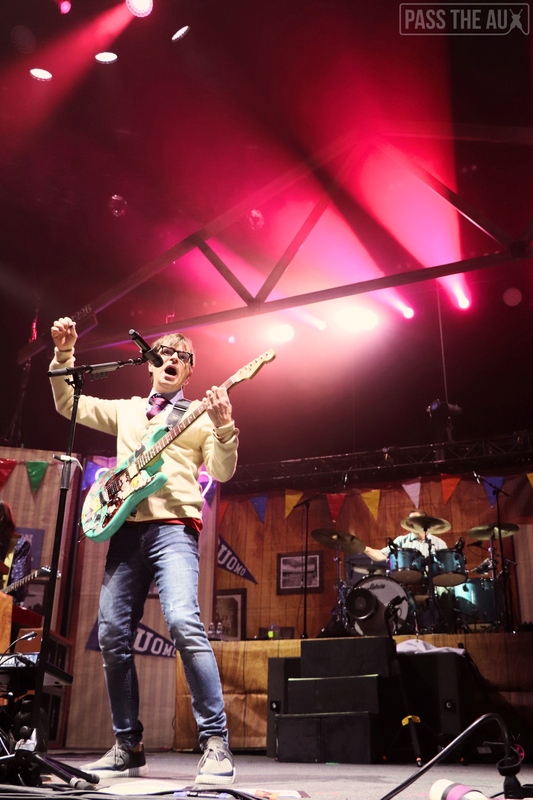 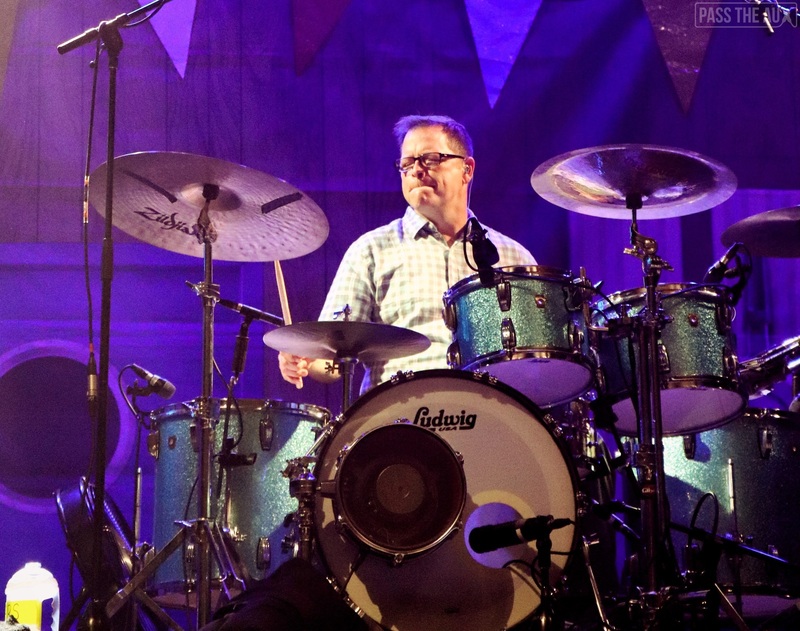 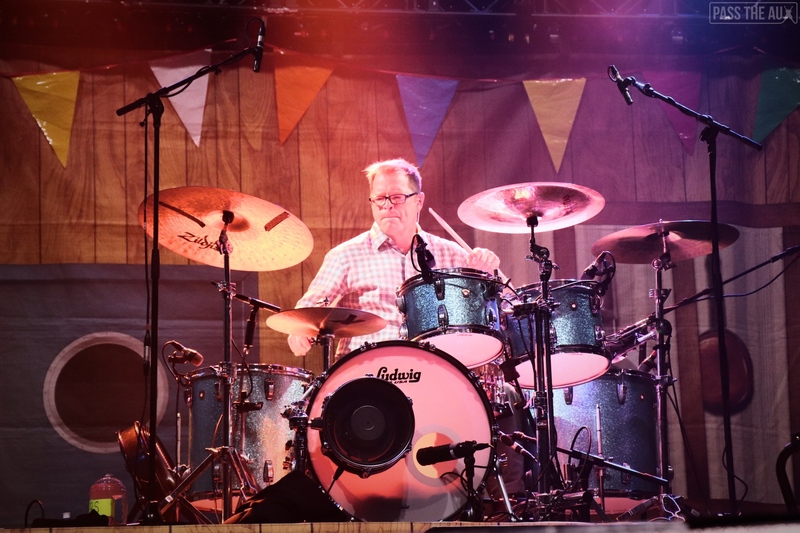 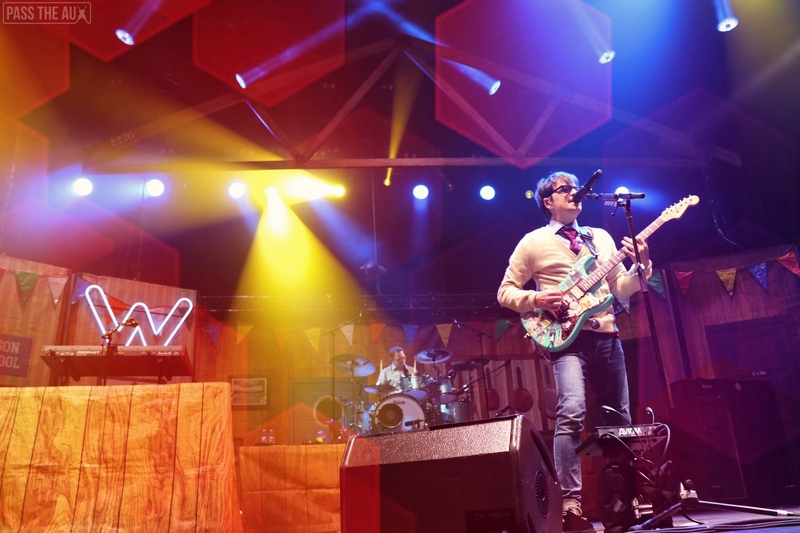 In a nice touch, the stage set-up changed as often as Rivers did – after it was the Happy Days diner, it transformed into a real garage with poster-laden walls a la “In The Garage.” After that, the set itself tracked the success of Weezer as a band. 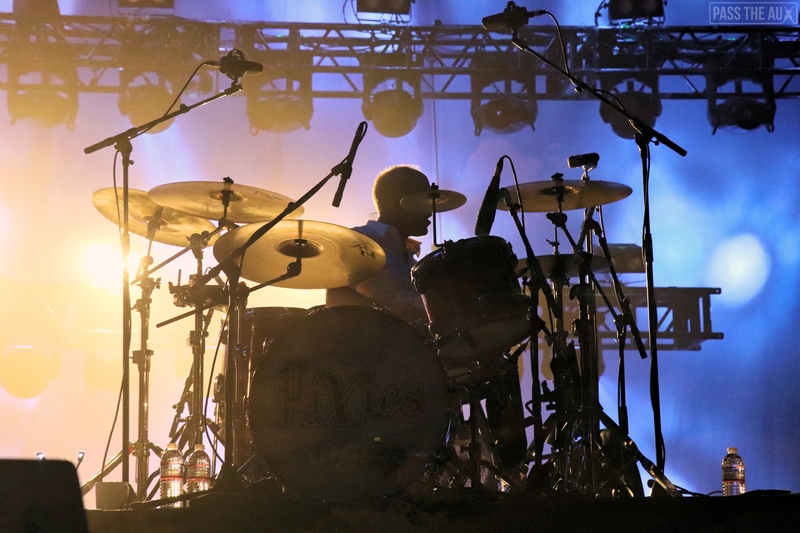 It started to look like the stage of a group rising in popularity with more sophisticated lighting equipment and pyrotechnics. 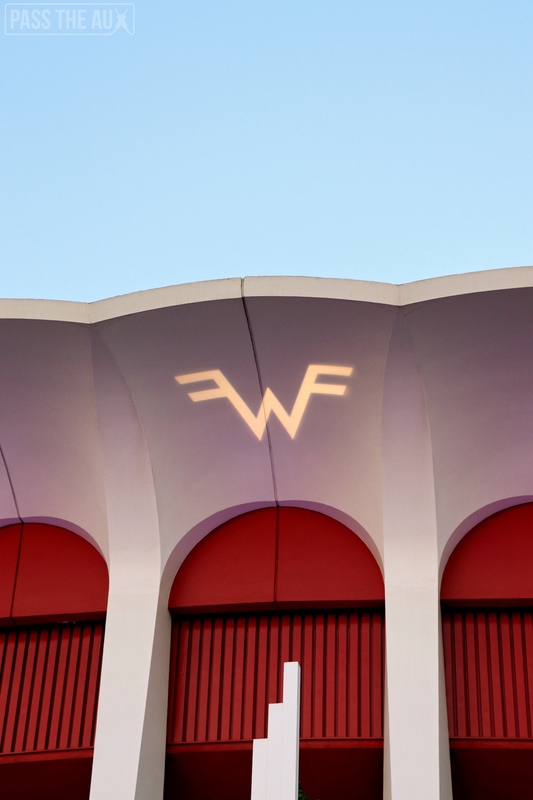 The iconic Weezer =w= symbol started out as a humble neon sign before growing in size and being lit with DIY Christmas lights. 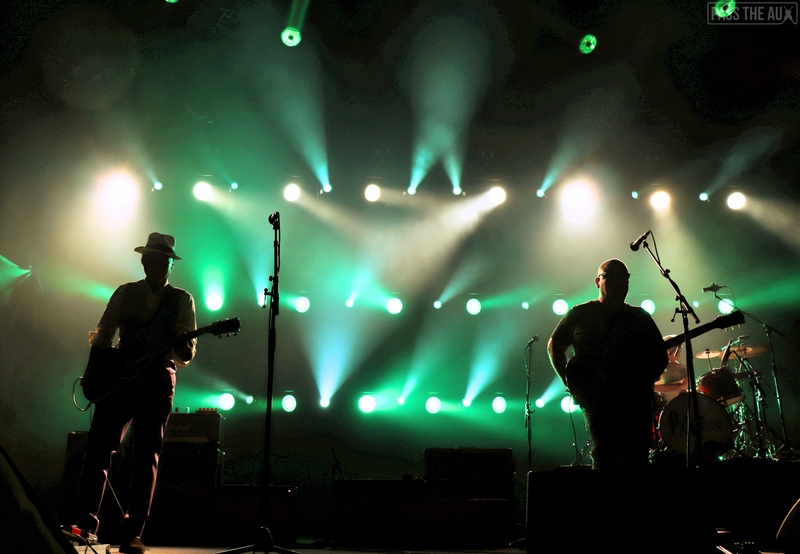 By the end, the whole sign towered over the quartet and looked like something you’d spot on the Las Vegas strip. 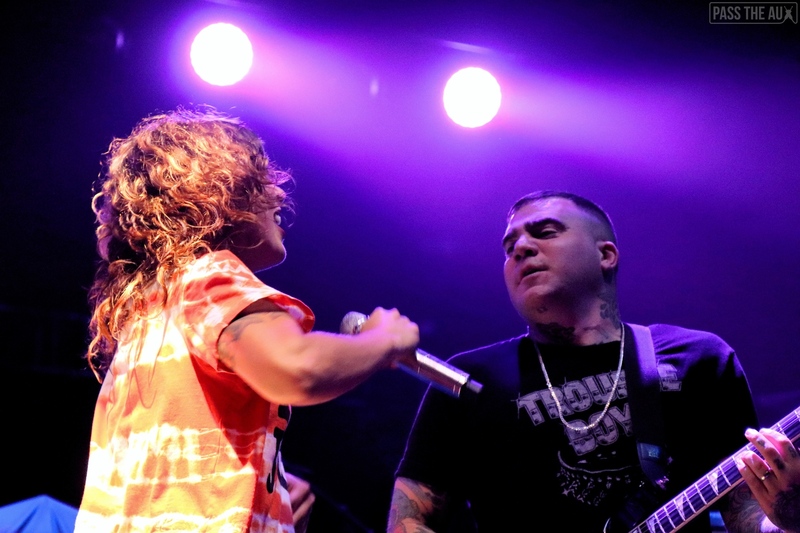 Never ones to miss a chance at bridging generational gaps, the band performed a shockingly surreal mash-up of Green Day’s “Longview” with the Turtles’ “Happy Together” that was much better than it had any right to be. 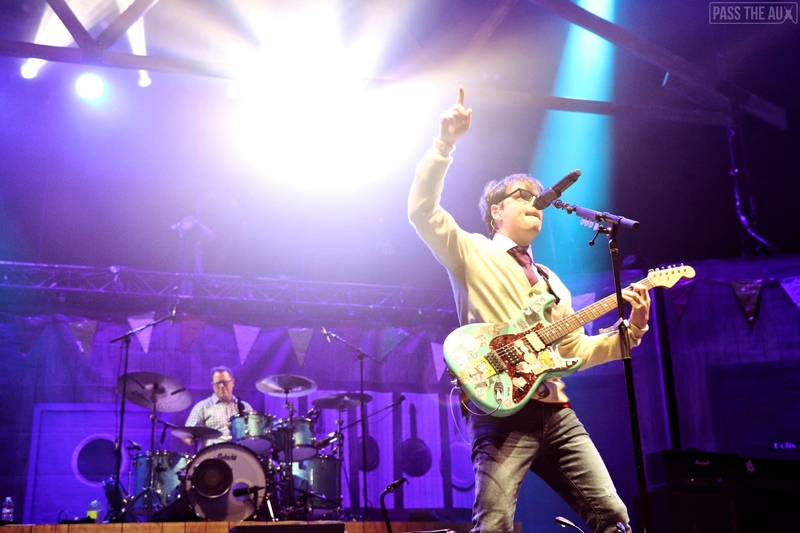 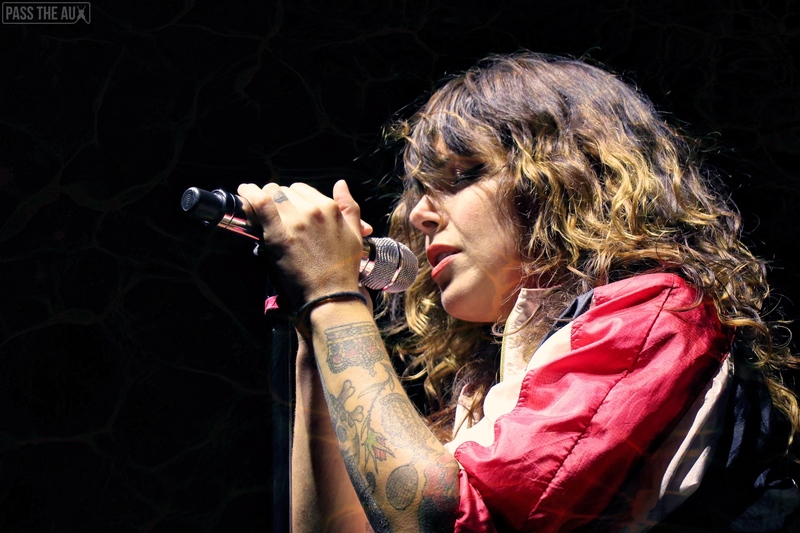 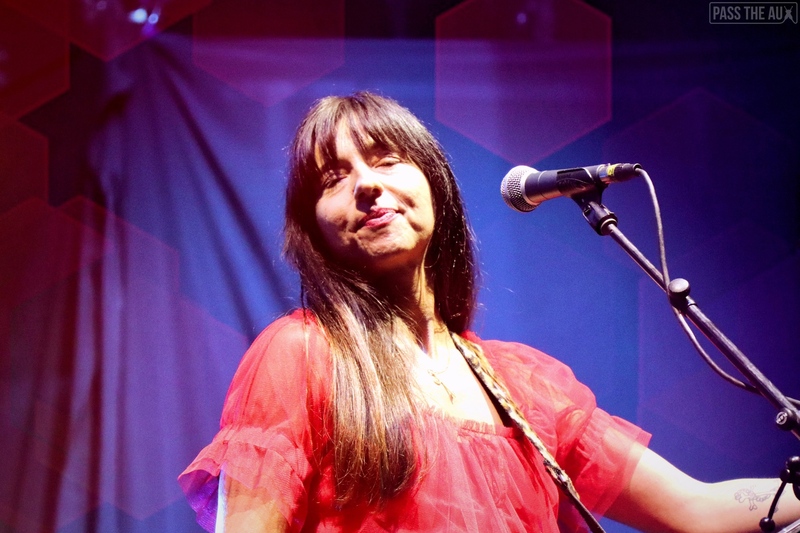 Rivers then took residency of a secondary stage before performing an acoustic version of “Island in the Sun” that turned into a stripped-back version of A-Ha’s “Take On Me.” The final twist of the night occurred when their Toto cover of “Africa” featured surprise guest Weird Al Yankovic on vocals and accordion. 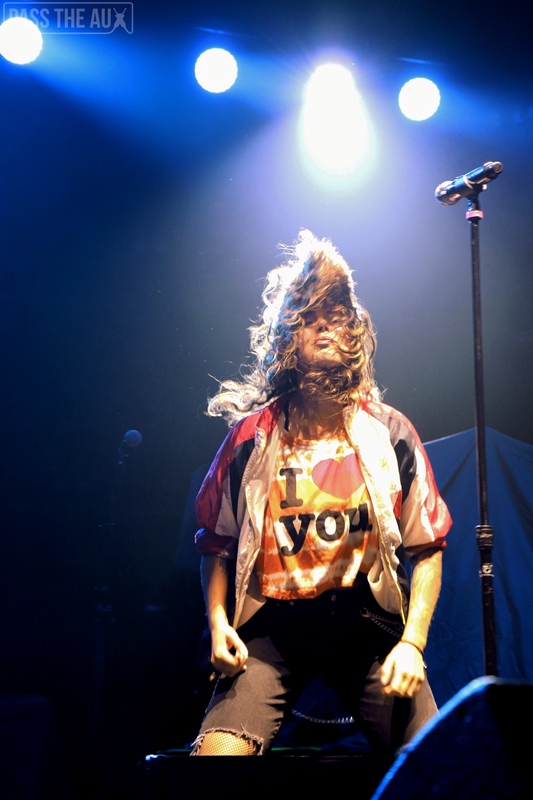 It was a roller coaster of a night. 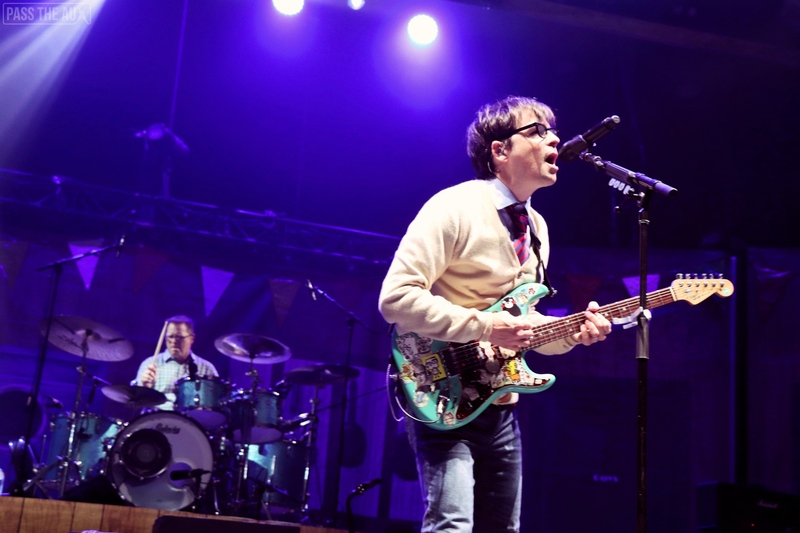 All this is to say that Weezer — whether people have strong feelings about how Pinkerton was the last great record they’ll ever make or not — know how to entertain. 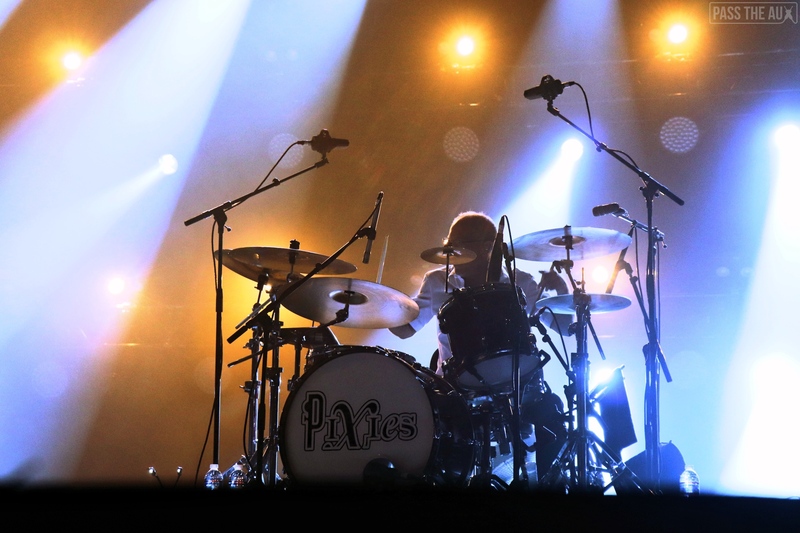 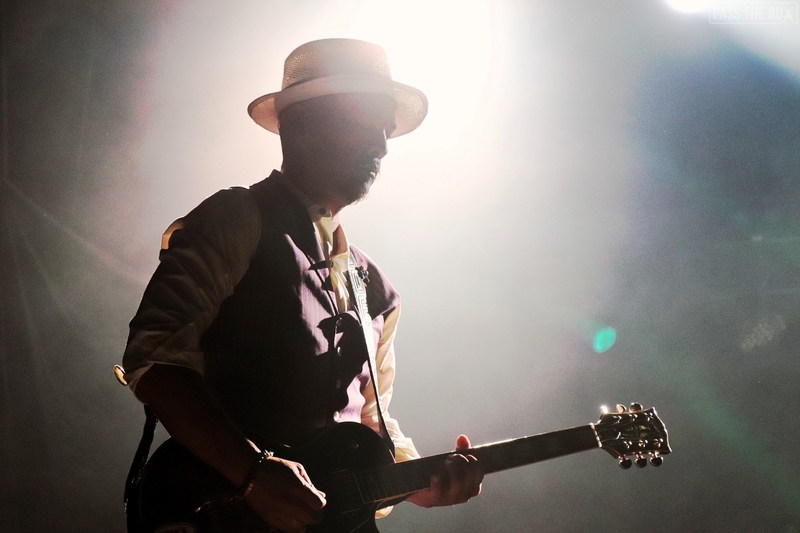 They left cynicism at the door and embraced everything that is fun about rock music written with a pop sensibility. 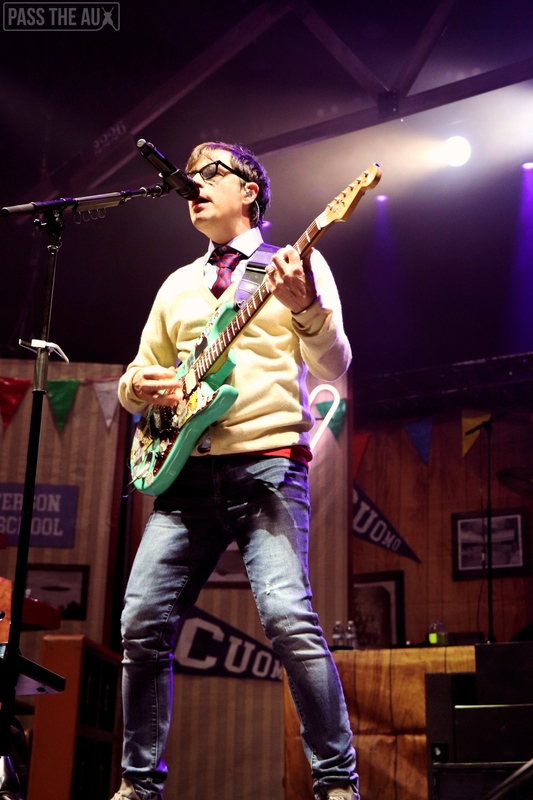 When Rivers Cuomo stood onstage before a sold-out crowd of nearly 18,000 people in a Nirvana t-shirt with torn off sleeves singing, “This feels like summer / I feel like summer / oh-oh!” he wasn’t interested in playing deep cuts from his new record. 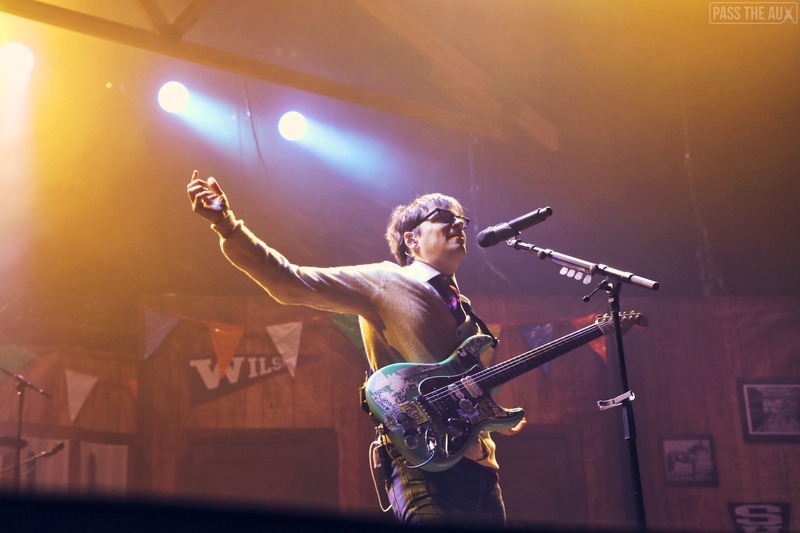 He’s a rock star having the time of his life and he wants everyone else to do the same. 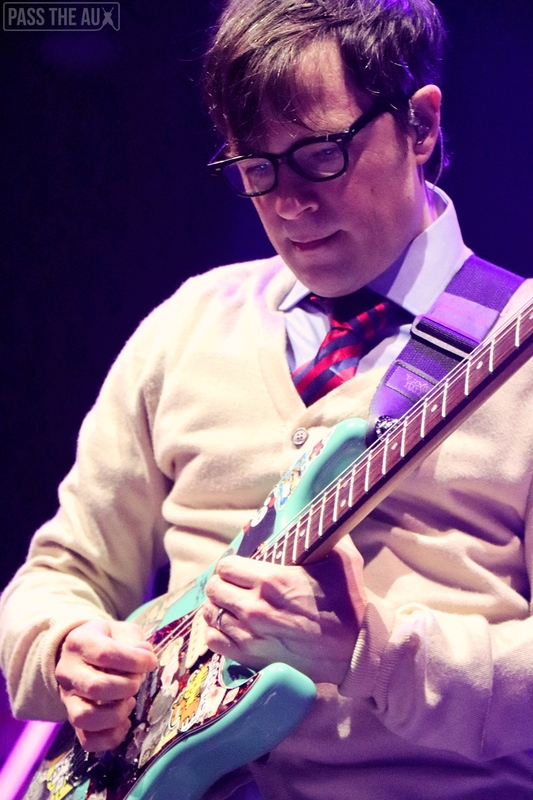 Let’s all get on Weezer’s level, folks.